Click here to go to my 2010 diary. 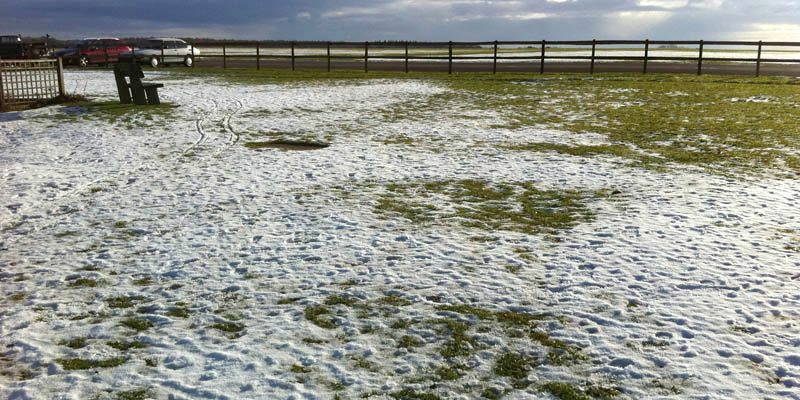 Winter flying with remnants of recent snow still on the ground. 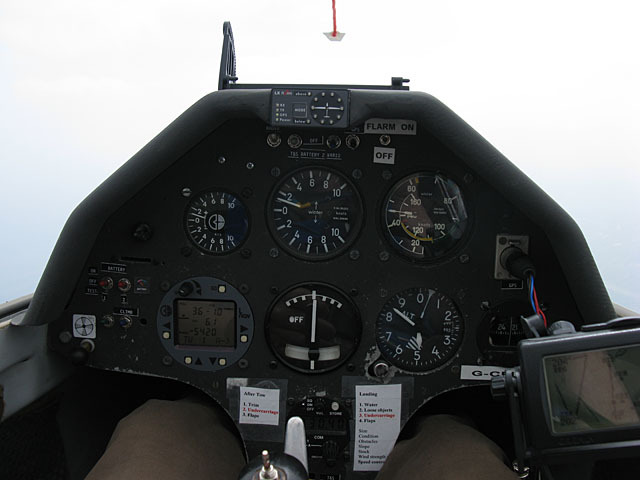 It was very quiet but I managed to get hold of and fly a K21 (431). 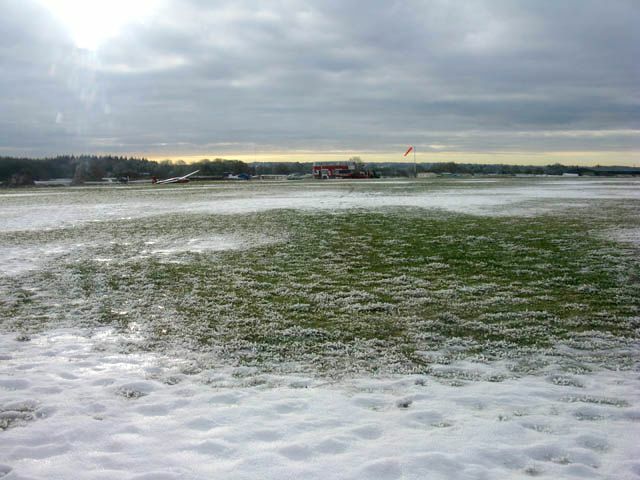 Although most of it had already melted this is still the most amount of snow I have seen from above while gliding, since usually when thick snow is present I tend not to be able to get to the airfield in the first place. 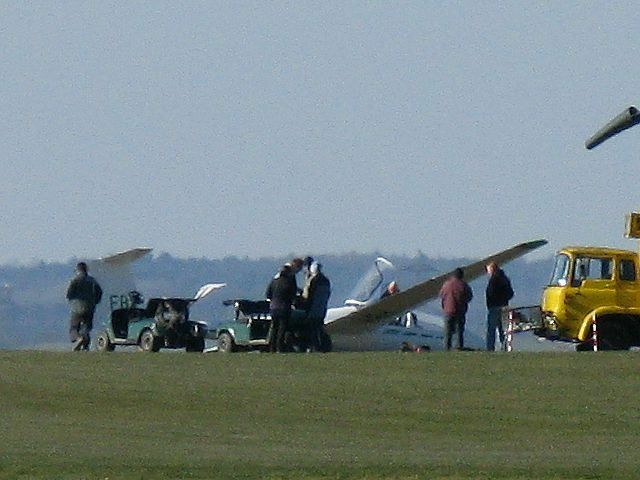 The launch point on a south side apron, as the runway is being used for large jet movements. 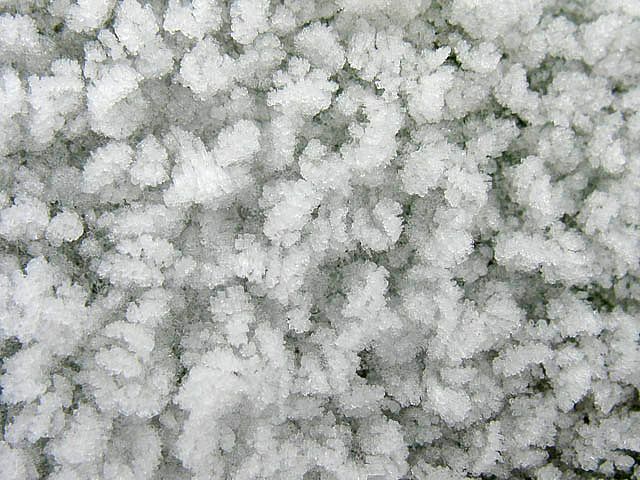 A macro shot of thick hoar frost on top of a snow patch. 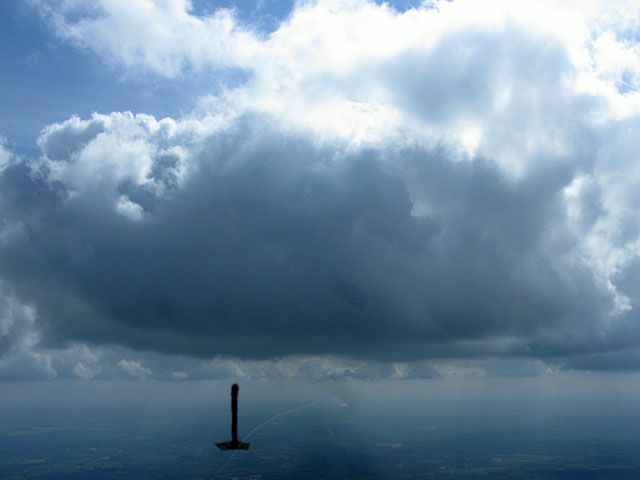 Another view of the launch point. Snow showerts brewing to the North. 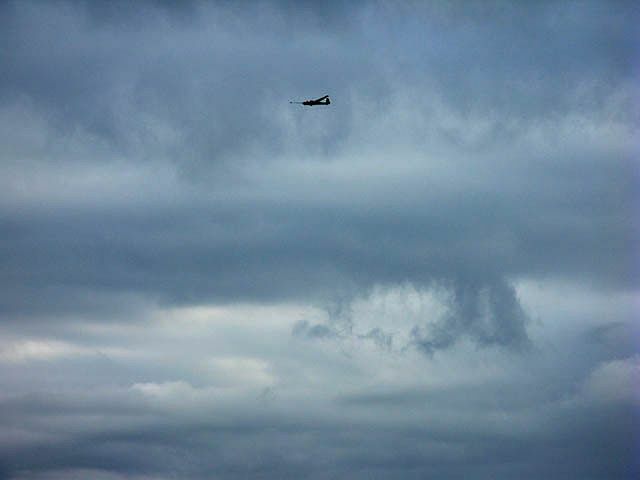 K13 flying under moody looking clouds. 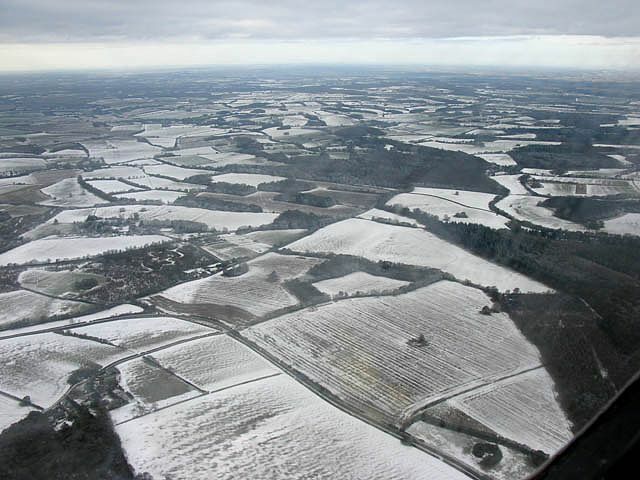 Views of the local North Hampshire landscape covered in patchy snow. Pretty! 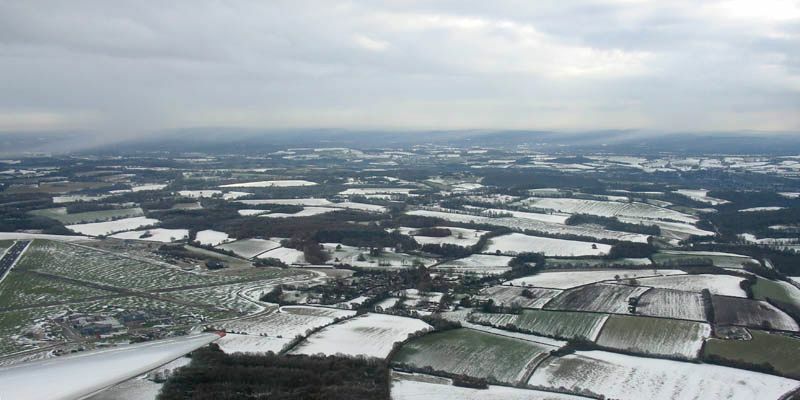 You can see that the remaining snow is quite local, with fields further afield clear of snow. 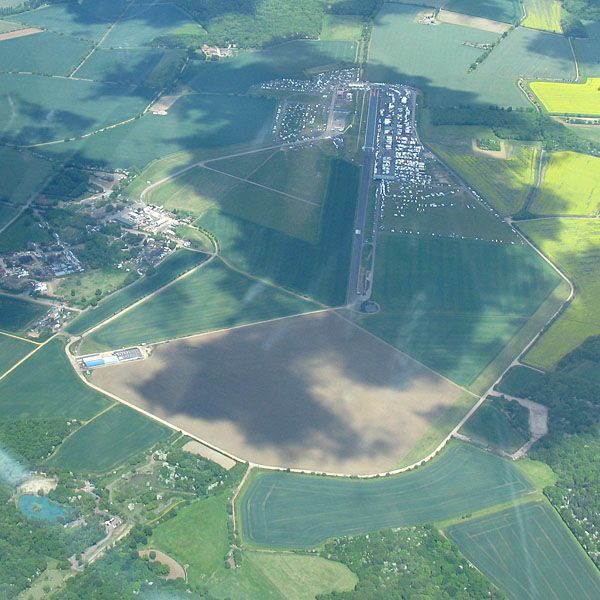 Looking down at the airfield from the Southwest at about 1700 feet. 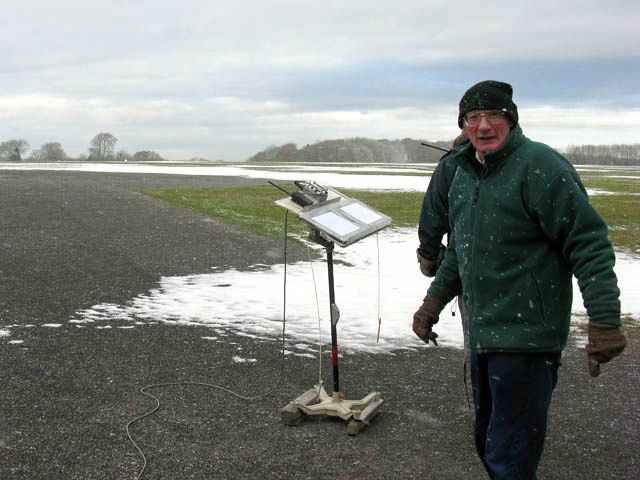 A jet is visible on the main runway which landed just before I winch launched. 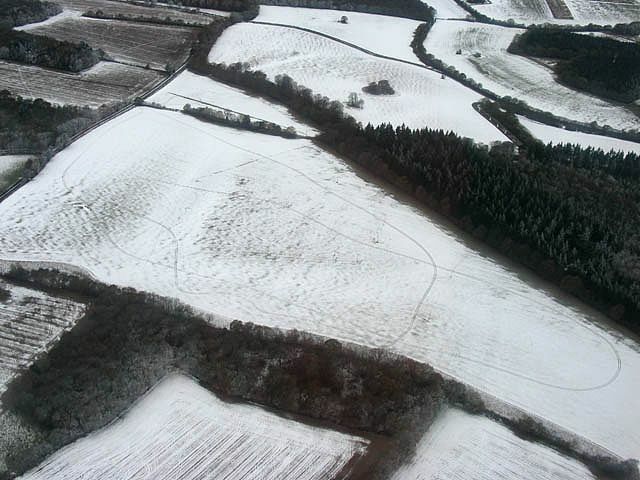 closeup of tracks in the snow in one field. 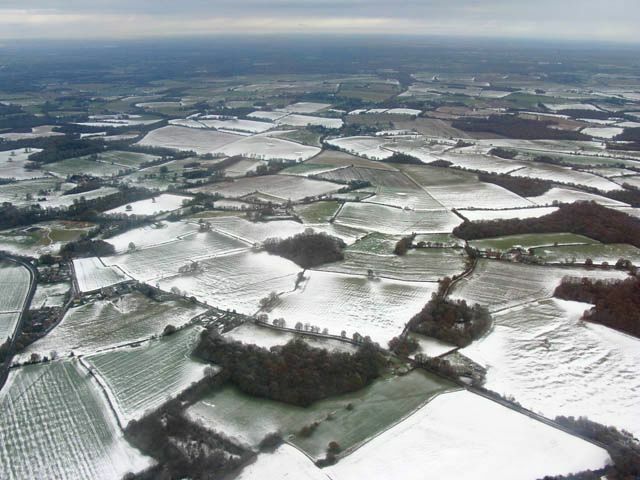 Another view across snow covered fields. 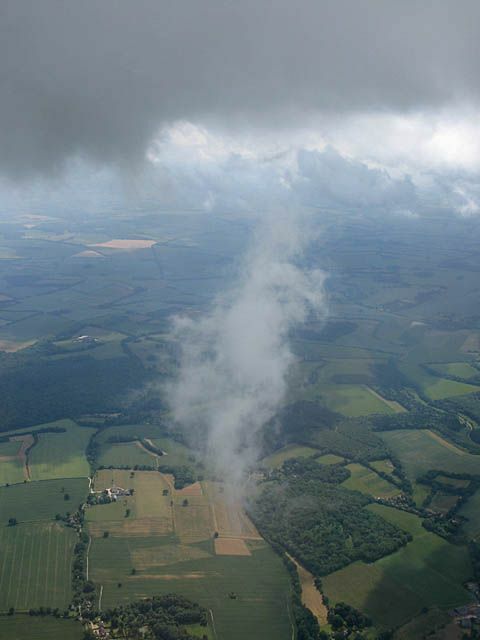 Snow shower plumes visible to the East. 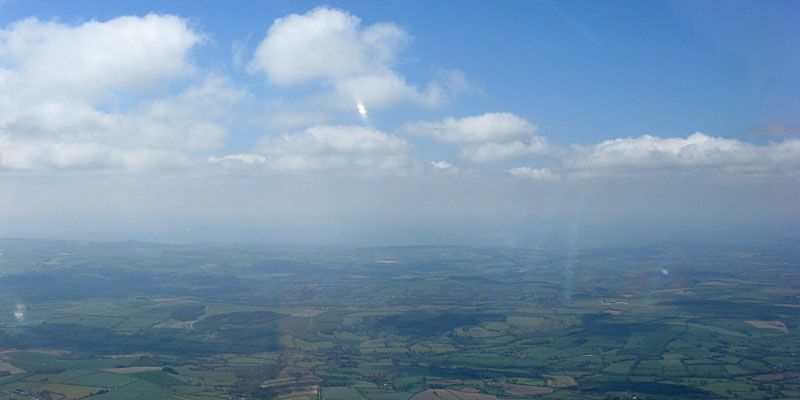 Looking back to the launch point from where I landed, and at the glider where it came to rest. Awaiting a retrieve... Back at the launch point a snow shower arrives. 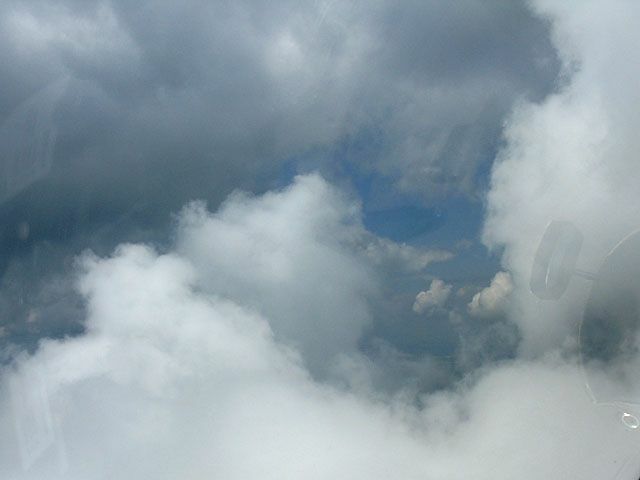 The next pilot to fly the K21 launches in it. 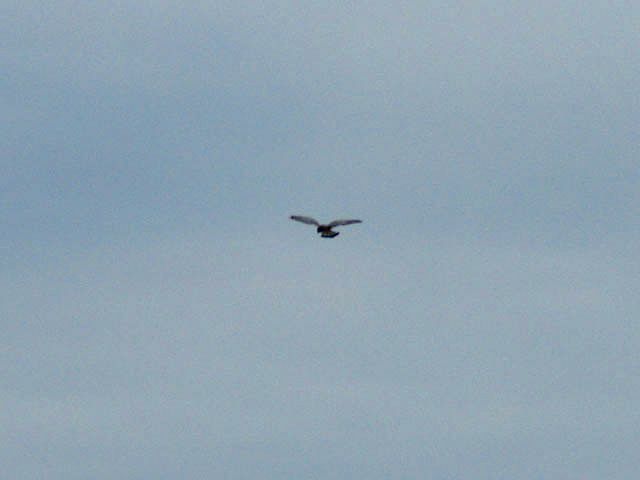 A Kestrel hovering near the edge of the airfield. 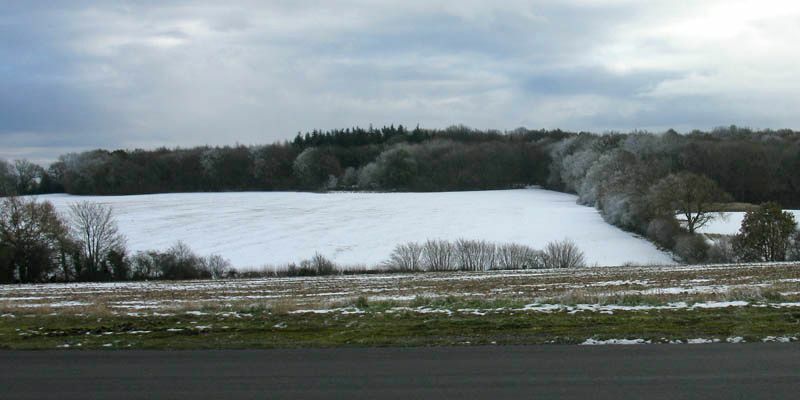 Snow covered field to the Southeast of the airfield. 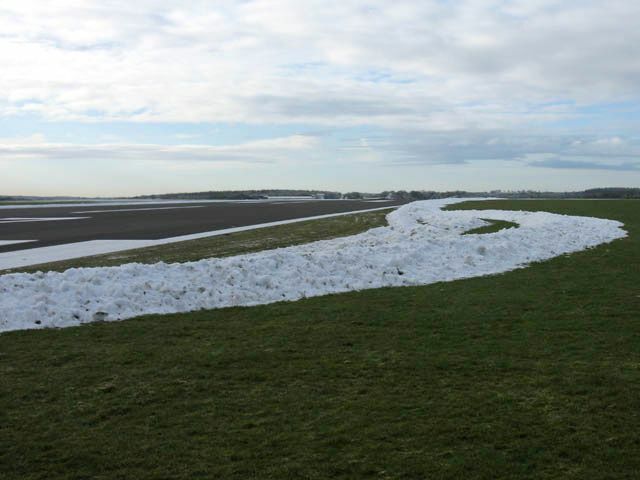 Deep snow banks along the edge of the runway where it had been cleared after it fell. 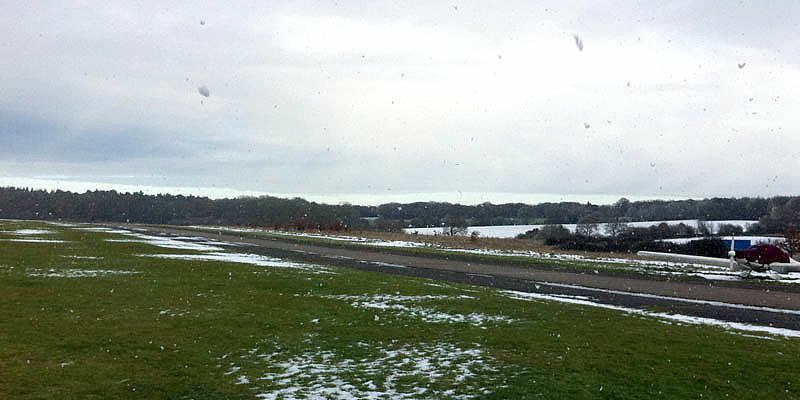 Back at the clubhouse for lunch, the sun came out after the snow showers cleared. 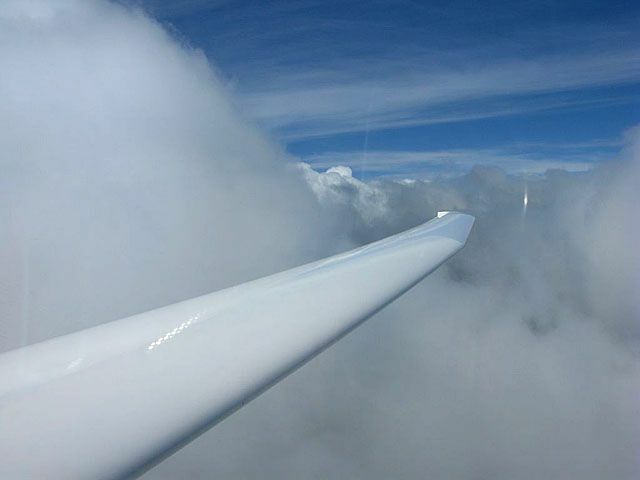 Soaring to cloudbase. 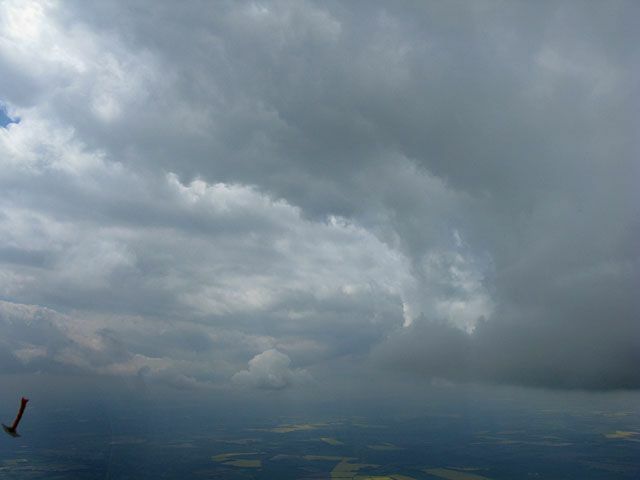 Looking south towards better skies. 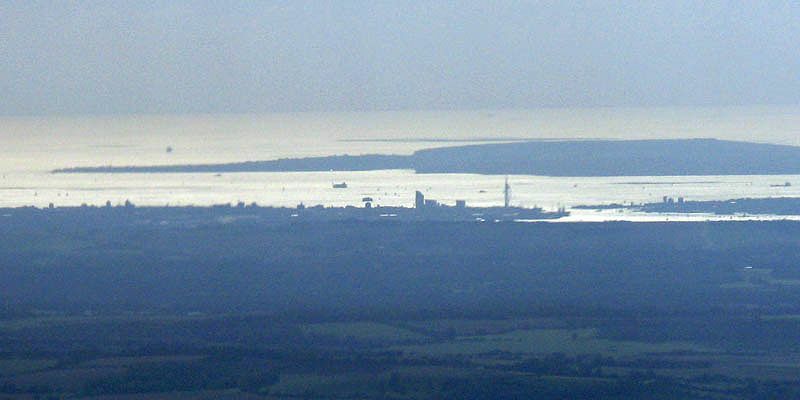 A closer view of Portsmouth in the distance. The Spinnaker Tower clearly visible. 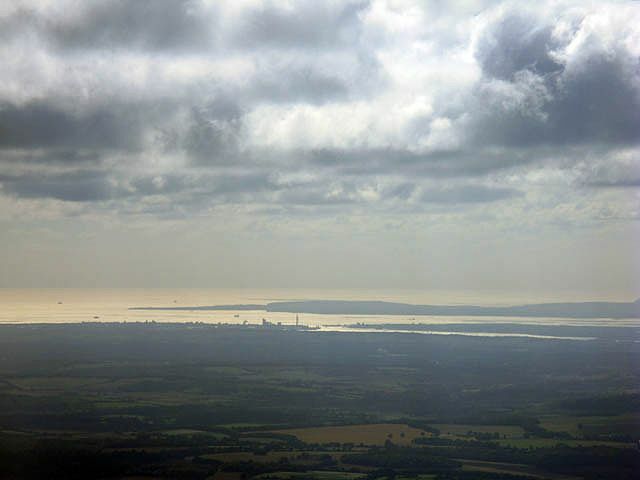 2 shot panorama of Hayling Island and Portsmouth taken from the Havant area before I turned back inland. 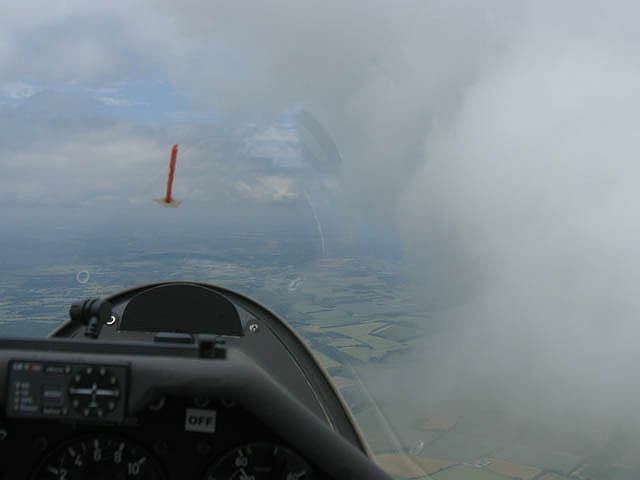 Clouds getting shallow as patchy top cover comes through. 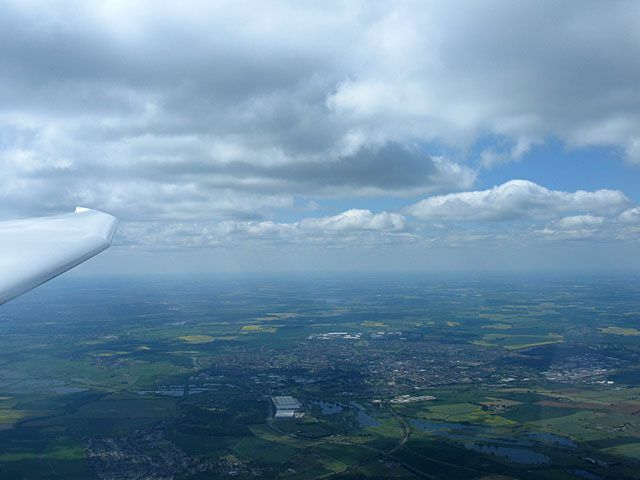 After a stay overnight I flew the same glider again today. 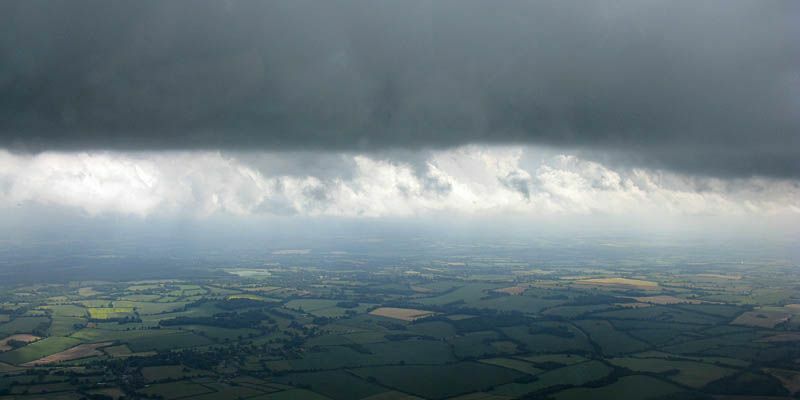 Spreadout was a major problem but still another lovely flight albeit at a very slow speed and getting low near Salisbury. 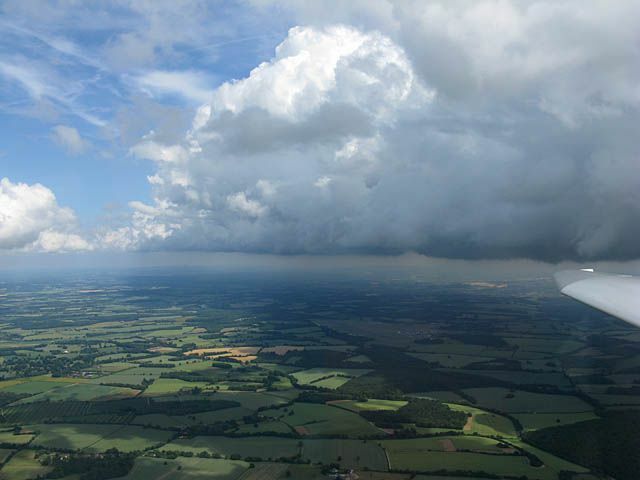 I managed a 2 shot panorama up at cloudbase. 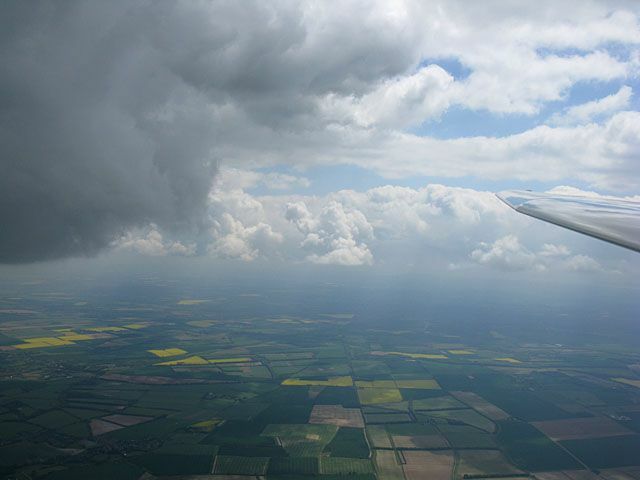 The spreadout that was a significant feature of this flight. 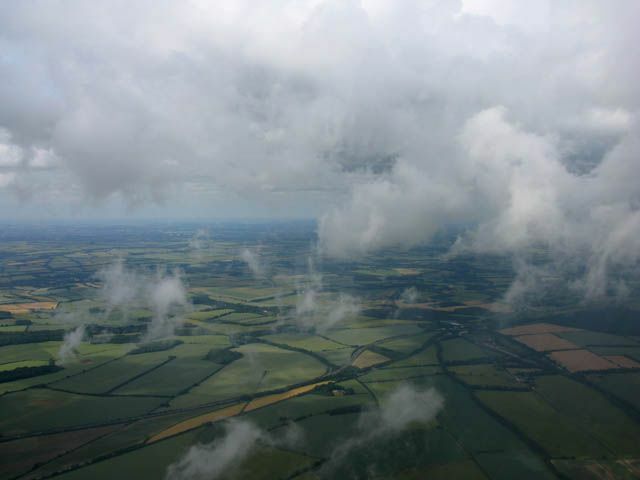 Having fun at cloudbase. 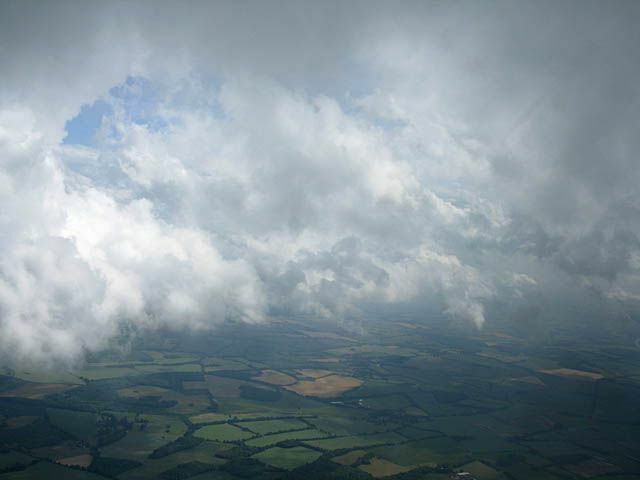 Another cloudbase panorama. 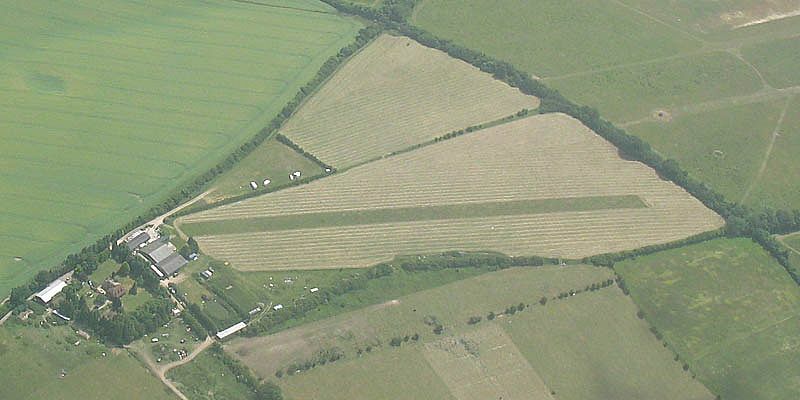 The air strip just south of Kingsclere mast. 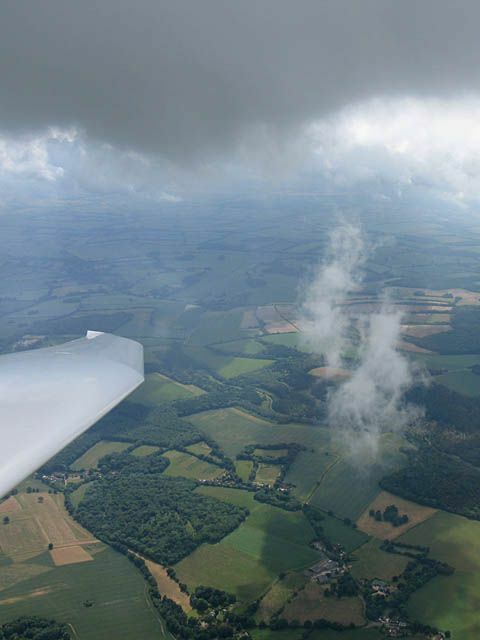 More cloudbase shots, including managing to fly over some lower wisps. 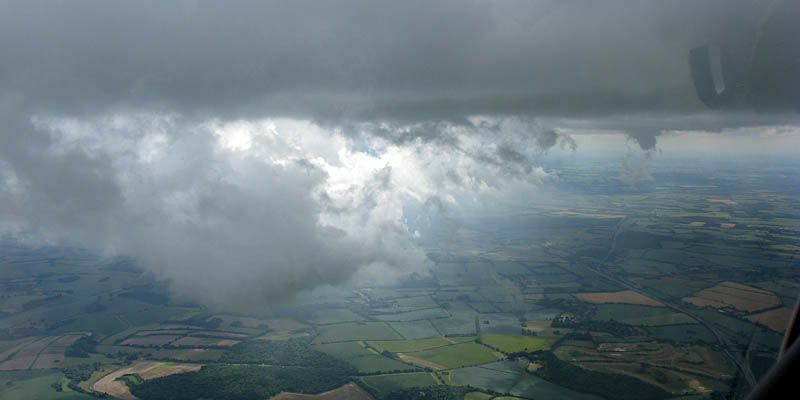 Looking South towards the Solent as I move Southwest to clearer skies. 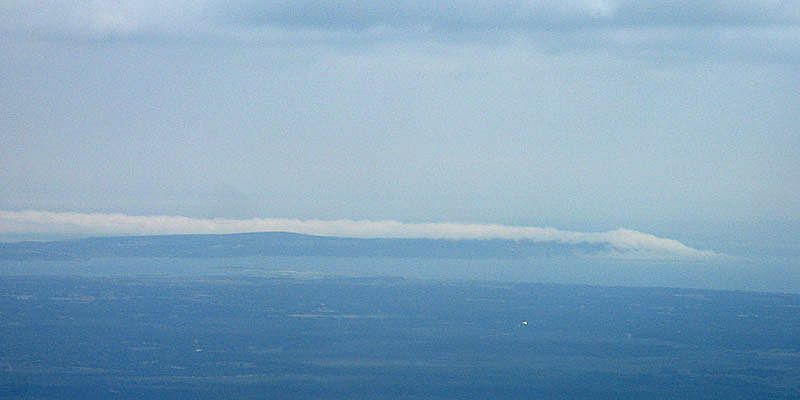 It looks like banks of fog on the Isle of Wight. 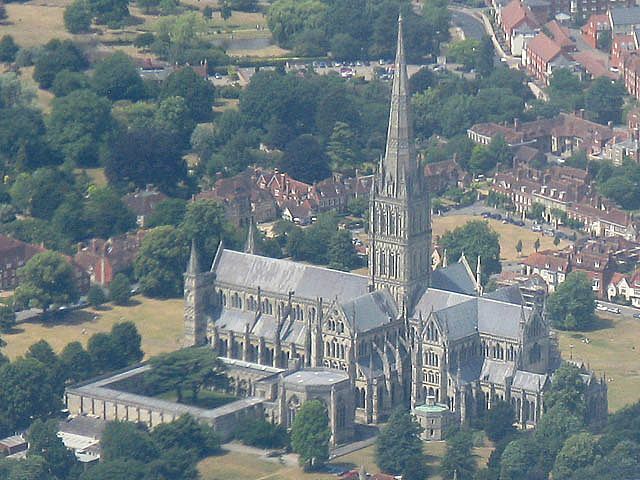 Flying around Salisbury and taking a closer look at the Cathedral. 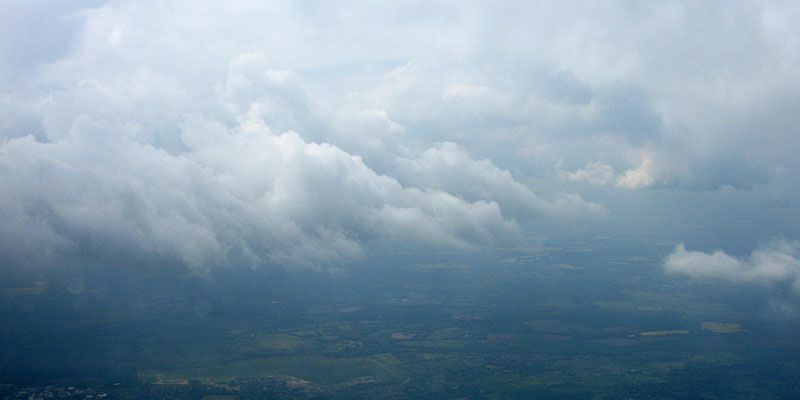 Today's flight was dominated by the exploration of a boundary between moist air from an old front and drier air producing a cloudscape that initially had me thinking it was a sea air convergeance. 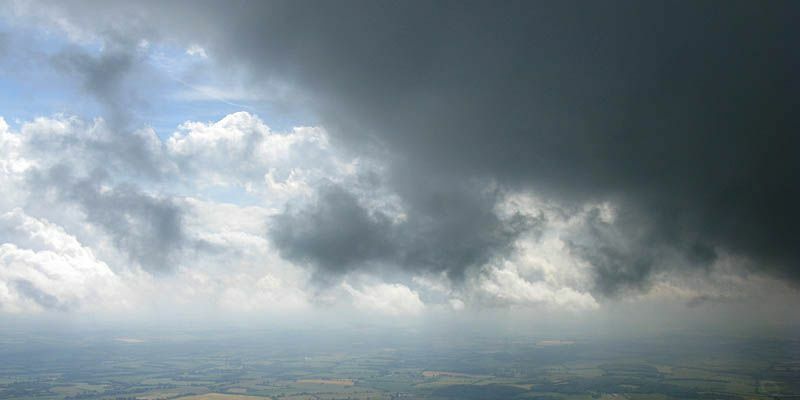 Whatever it was, the views were spectacular and stunning as I went up a 1000 foot wall of cloud on the dry side of the boundary. 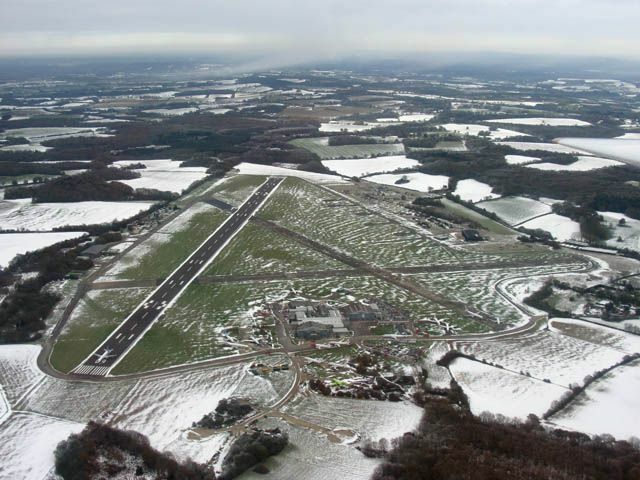 At Lasham cloudbase was between 2000 and 2500 feet above site. 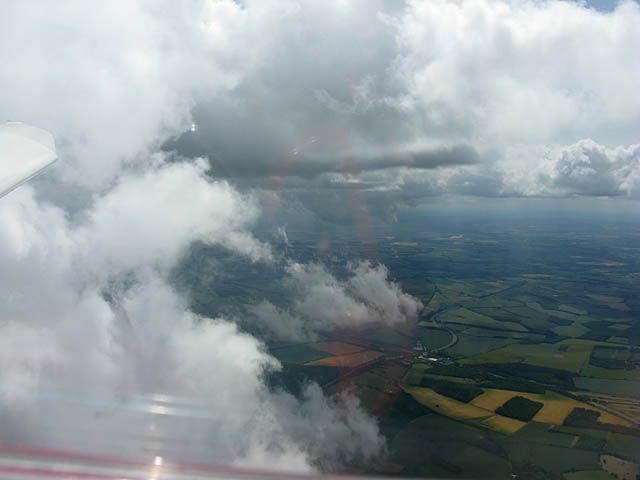 But at the boundary cloudbase jumped by over 1000 feet to 3700 feet. 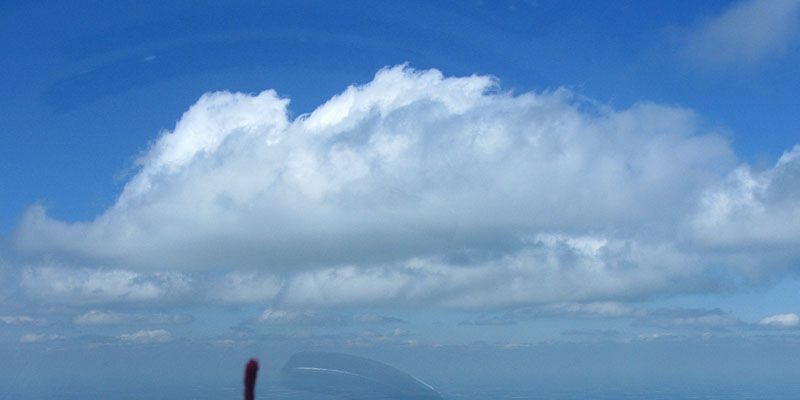 Further north cloudbase rose to 4000 feet and then went blue / wisps. 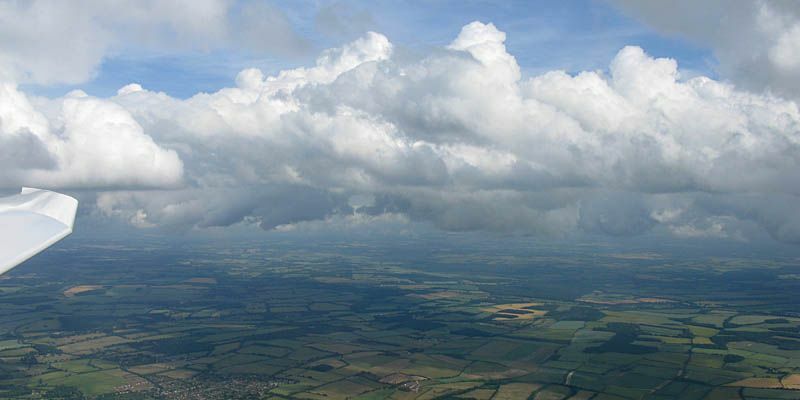 Beyond that was more cumulus in another convergeance zone on the far horizon. 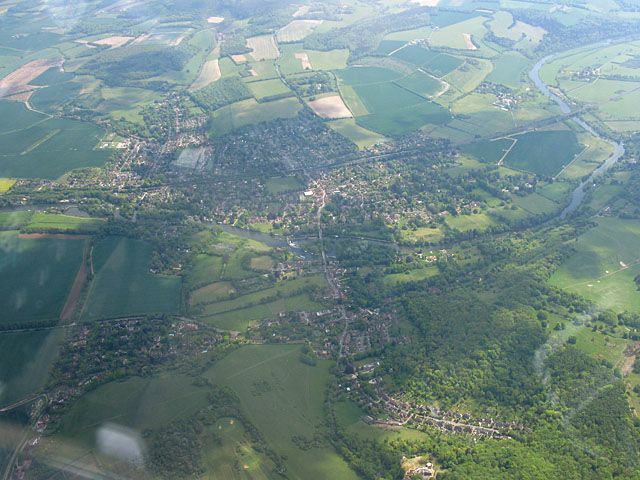 After exploring the boundary for atleast 20 minutes I then flew to Hungerford before coming back via Chilbolton. 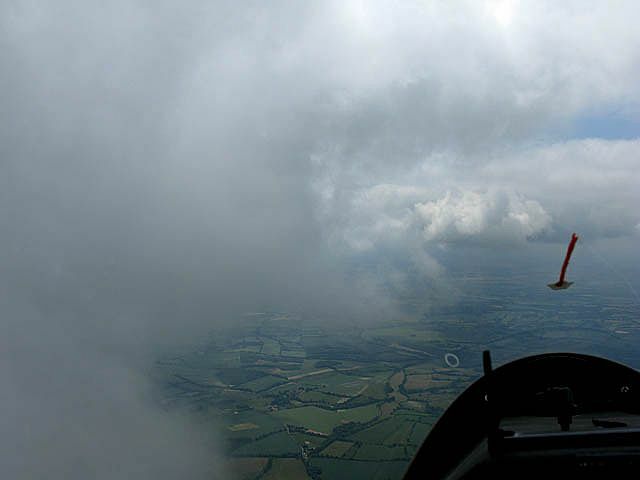 By then cirrus was incoming and conditions were weak, but I had just enough height to get back to Lasham so no problem. 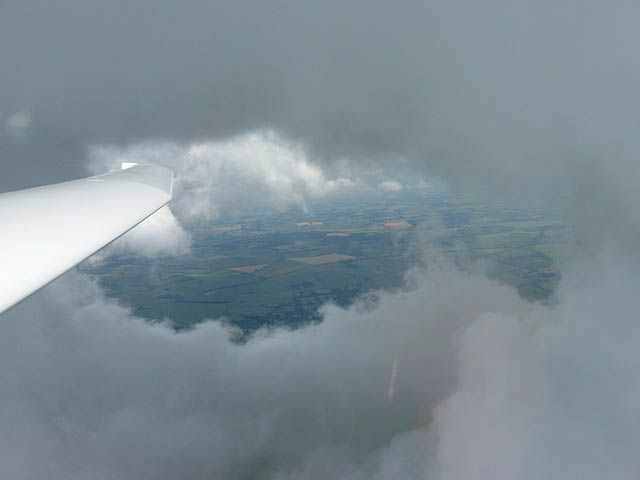 Looking out from underneath the monster cloud street over Lasham. 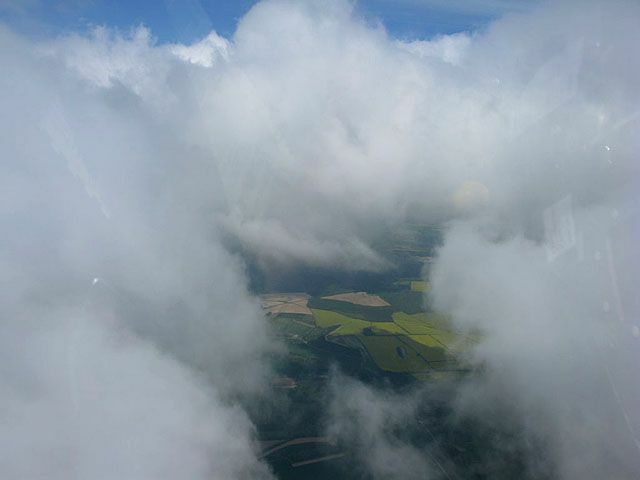 Flying North away from the monster street while looking Southeastwards back to Lasham. 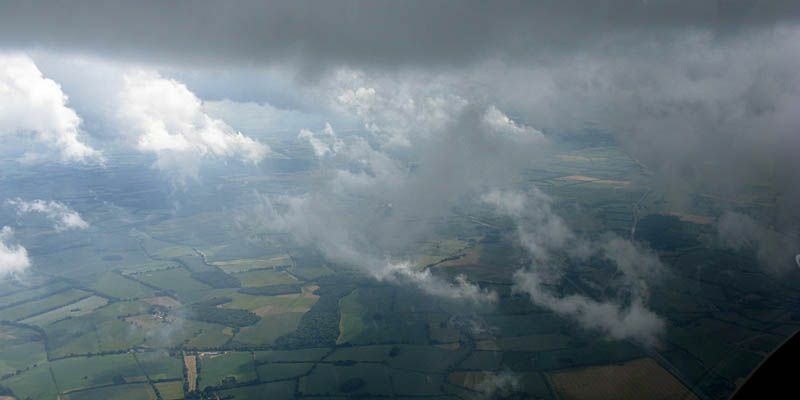 Exploring many weird and wonderful low cloud formations along the boundary of the moister and drier air a few miles north of Lasham. 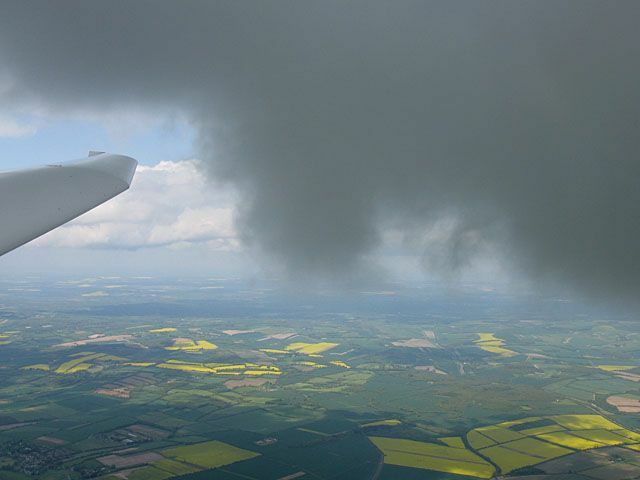 Wisps of cloud forming below main cloudbase as moist air gets entrained into a dry thermal on the boundary. 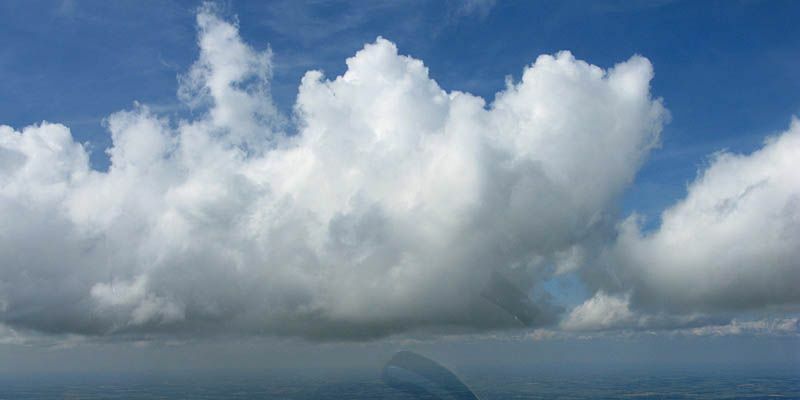 Flying West along the boundary between moist and dry air. 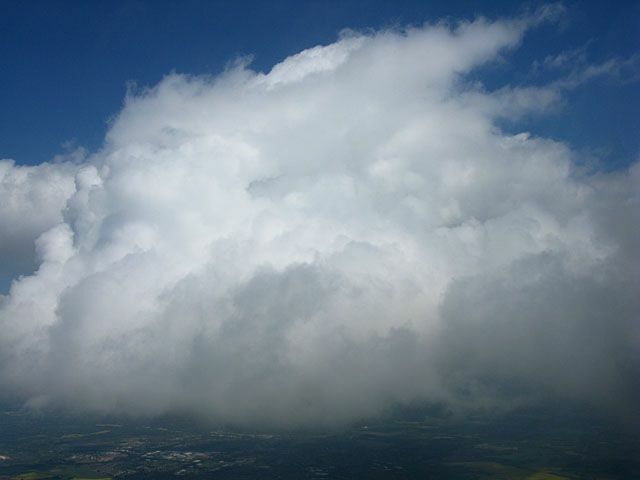 the different in cloudbases is over 1000 feet. 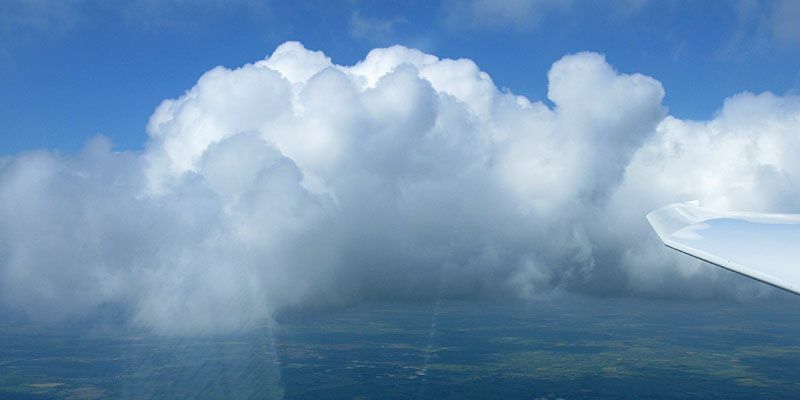 Flying West along the boundary between moist and dry air. 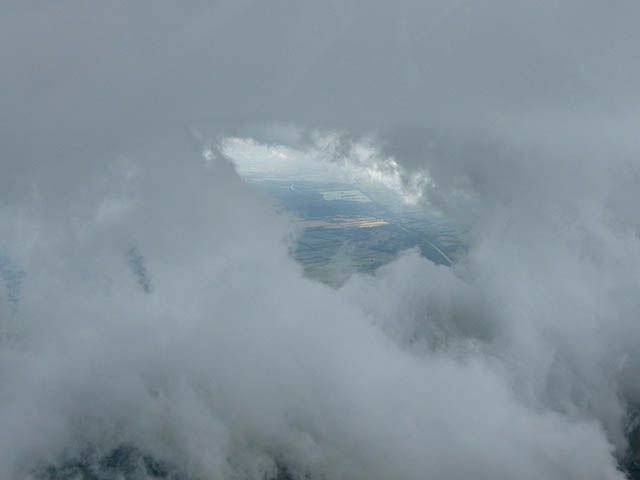 Peeking through a hole in the low cloud as I fly past. My best boundary shot. 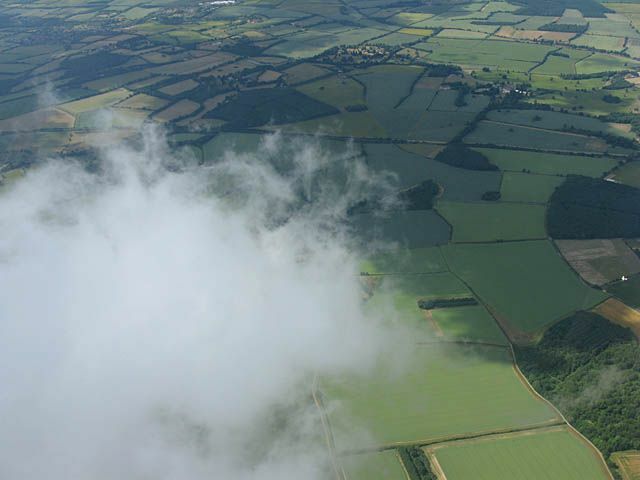 Flying over a lump of low cloud. Still flying along the boundary. 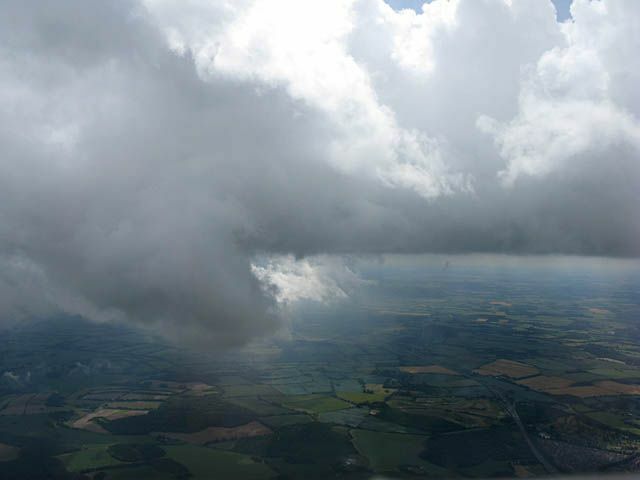 Low cloud over Popham. 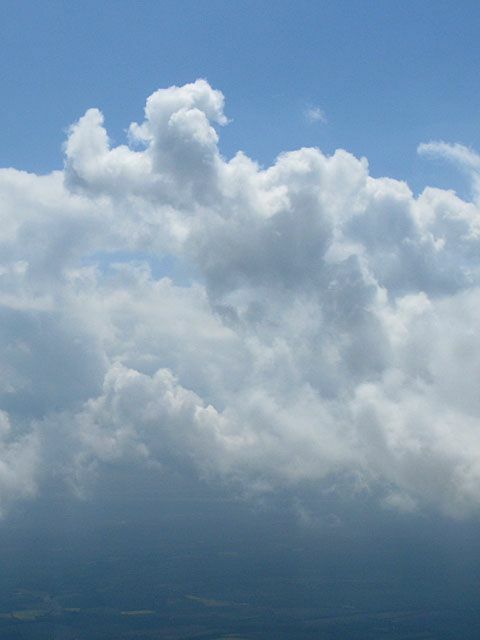 Looking north the drier air cumulus get smaller and smaller. 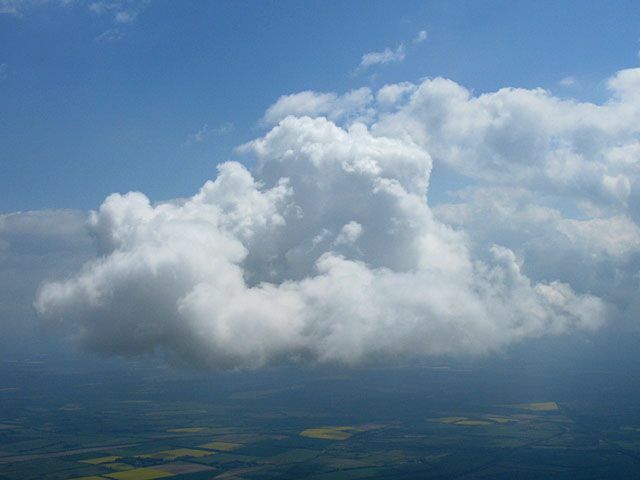 A nice looking cumulus cloud. From a distance to the north, looking back to the boundary. 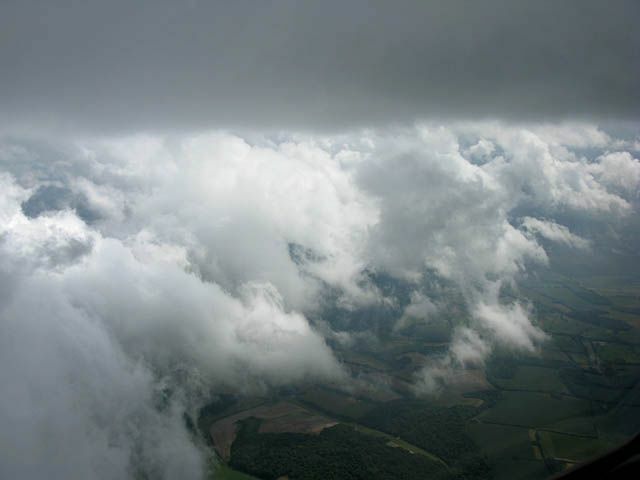 A few more shots as I explore around more low cloud before disappearing into the drier air for a while. My best day of the year so far. An early start and long day. 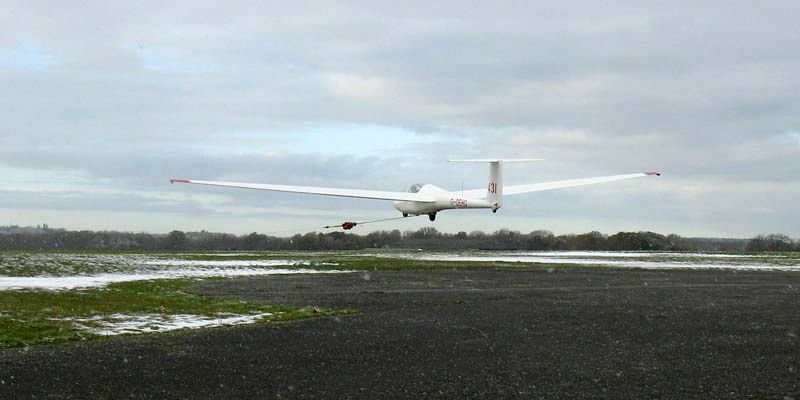 Thermals were hard to use at times and some gaps and areas of heavy sink to tip toe across but I still managed LAS-NOW-OXF-LYV-LAS for 403km, and was up for 6 hours 38 minutes, just 4 minutes short of my longest ever flight. 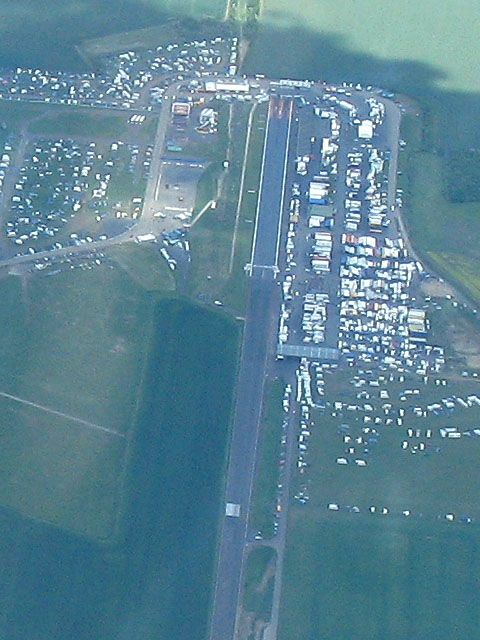 Santa Pod drag strip from the Southwest. 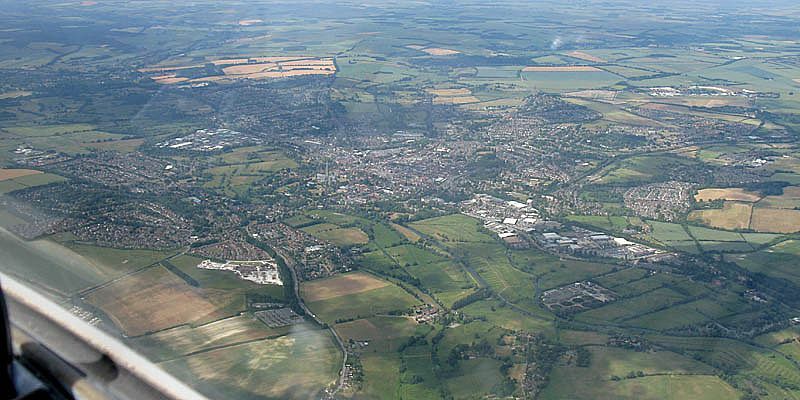 Looking West to Wellingborough from over Rushden. 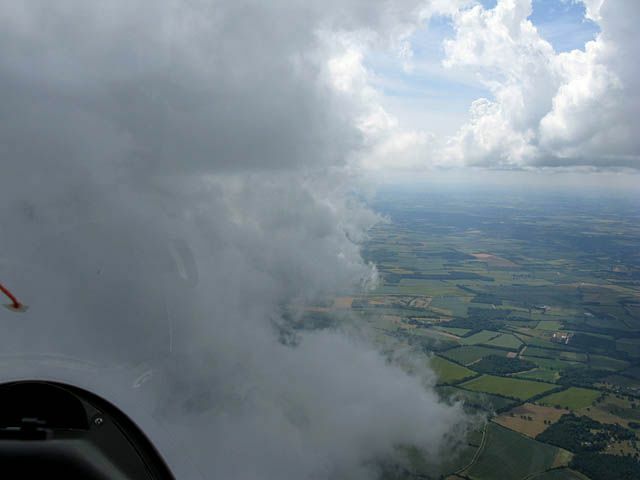 Small but working clouds as I push north. 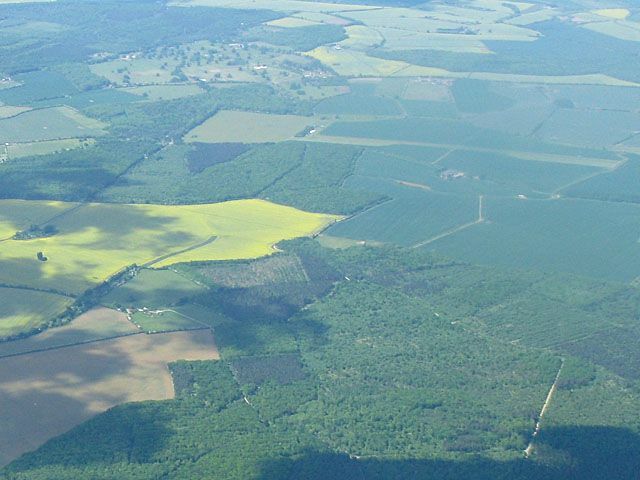 Lyveden gliding club and Fermyn Woods from the South-southeast. 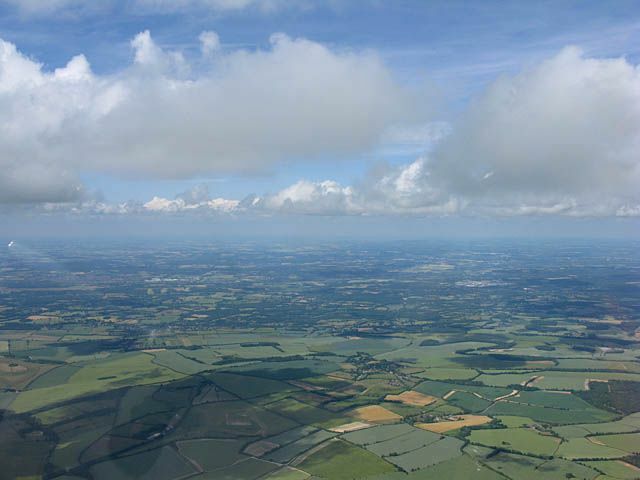 Looking back south from Lyveden towards Lasham, 145km away. 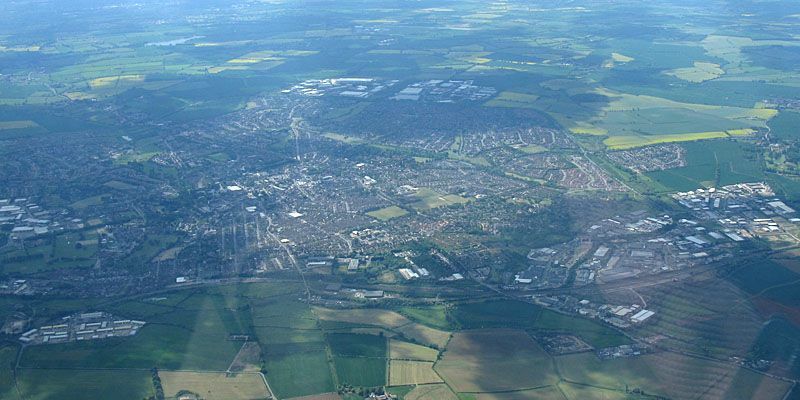 Time to go home... Rushden from the Western side. 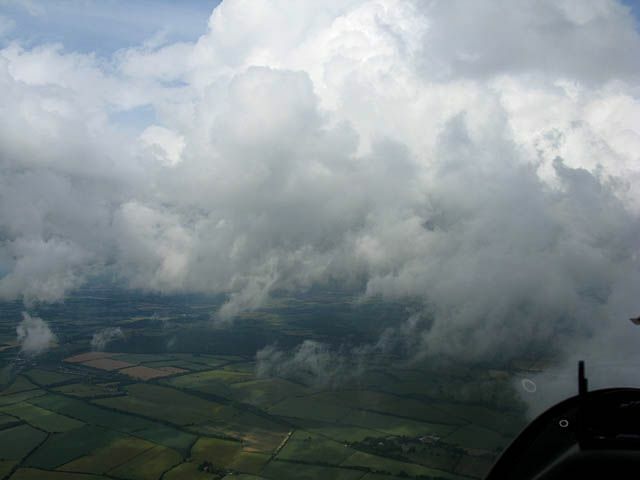 Clouds getting bigger again as I go further south. 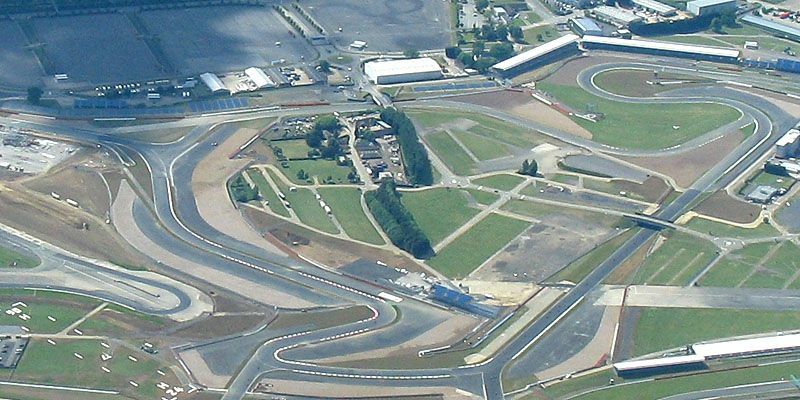 Silverstone from the East. 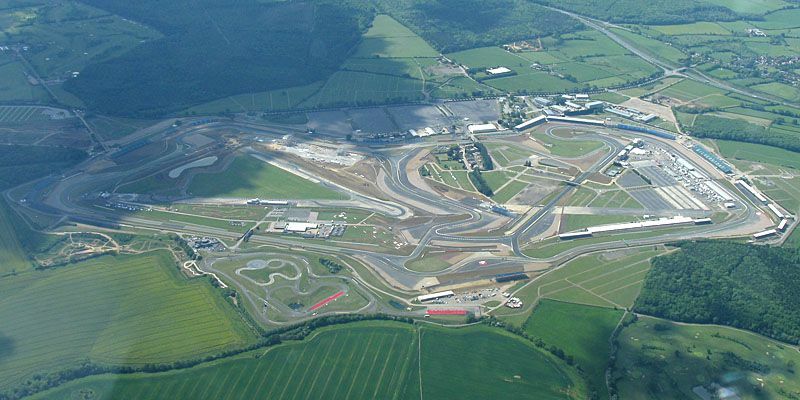 You can see the new track layout on the far side, done for the 2010 British F1GP. 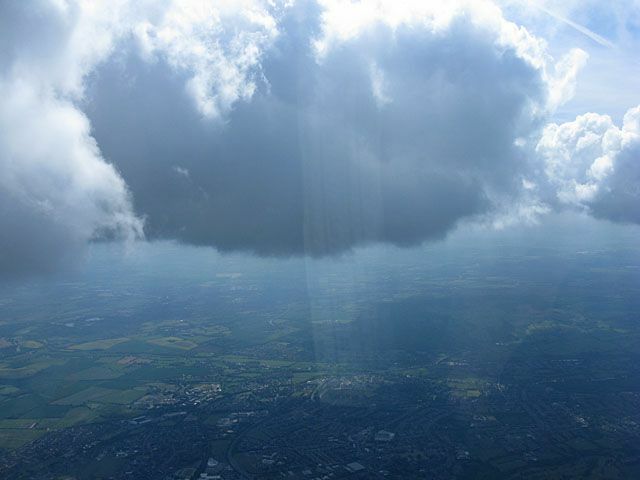 Bicester in cloud shadow from the Northeast. 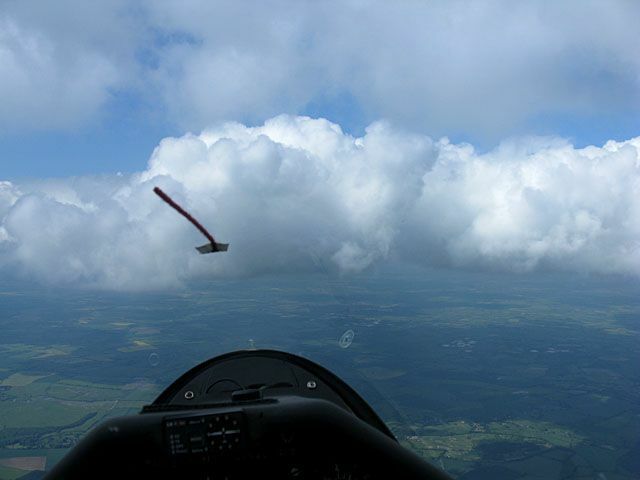 Passing the OXF turnpoint on the way home. Looking from the East. 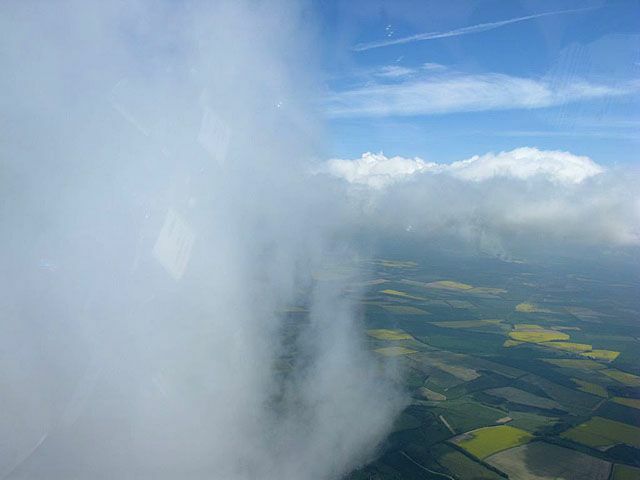 I took a small cloud climb near Oxford to help me across a gap to the south. An elephant riding a motorbike? Another day of spreadout, but with a lighter wind it wasn't forming monster streets and the gaps were fairly easy to cross. 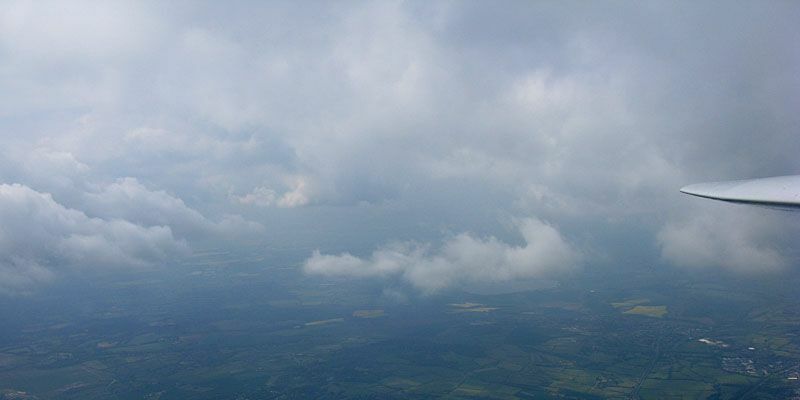 I ended up flying 255km, LAS-OXF-KGS-HUN-ISL-LAS. 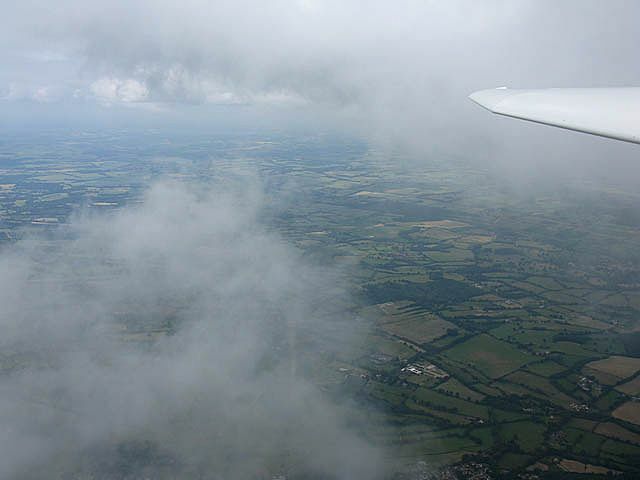 The highlight, after turning ISL, was finding an 8-10kt thermal over Oxford and taking it all the way to 7500 feet, more than 2000 feet above cloudbase. Passing Goring on the first leg. 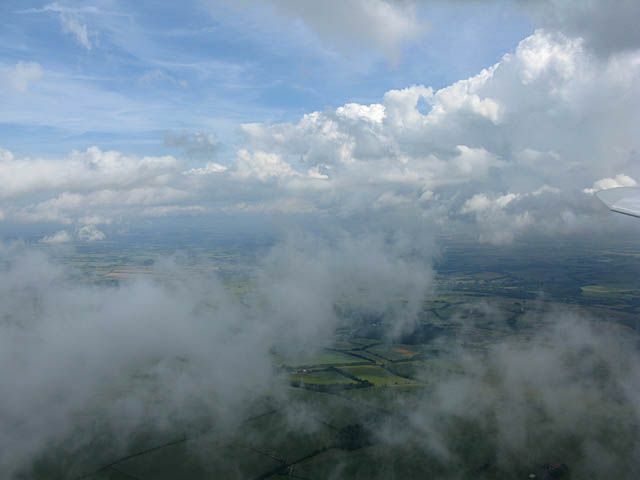 Lovely conditions at cloudbase. 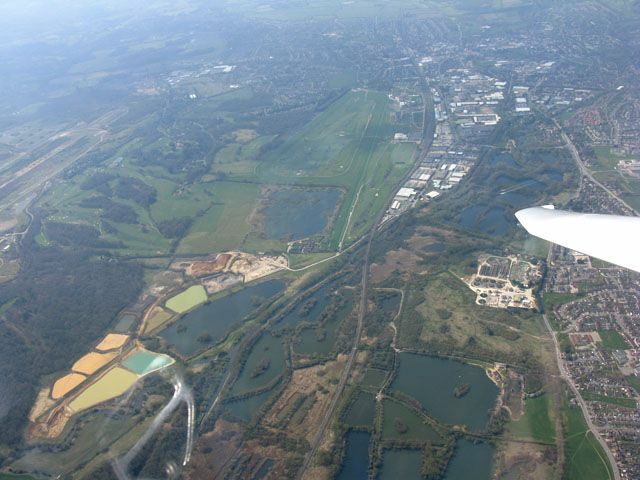 Passing Harwell further along the first leg. 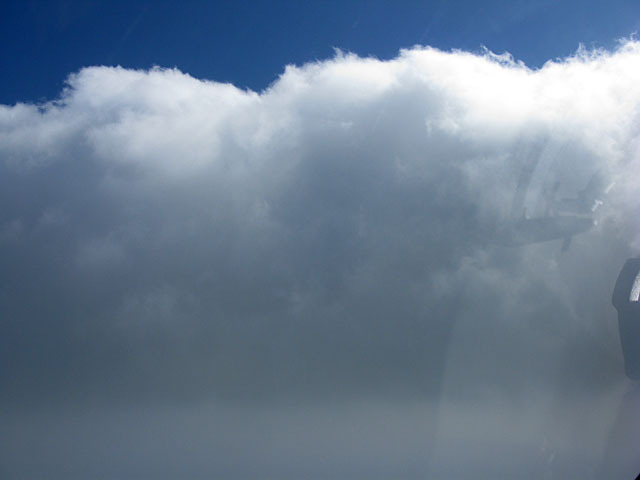 Some above cloud shots after the big cloud climb. 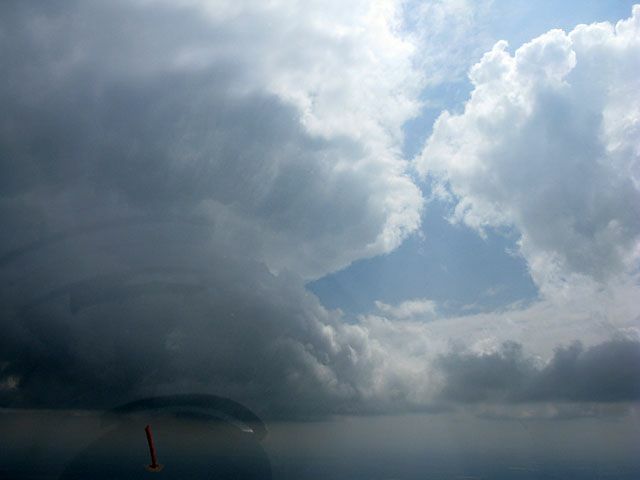 As my flight came to an end spreadout started to get severe. I'm glad this didn't happen while I was still miles from home. 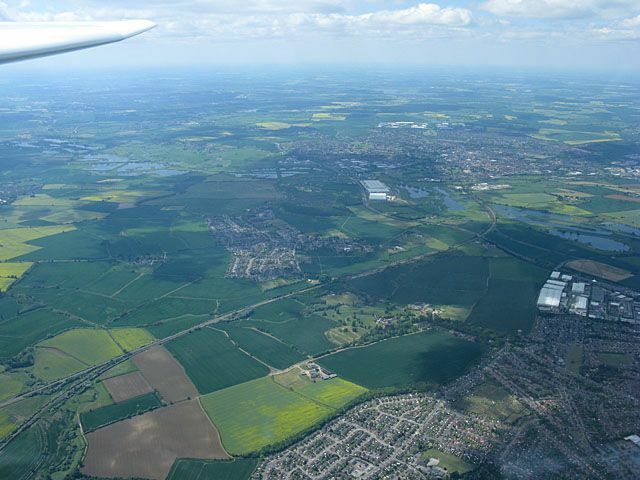 Pictures taken during a local soaring flight with big westerly spreadout streets with large gaps between them. 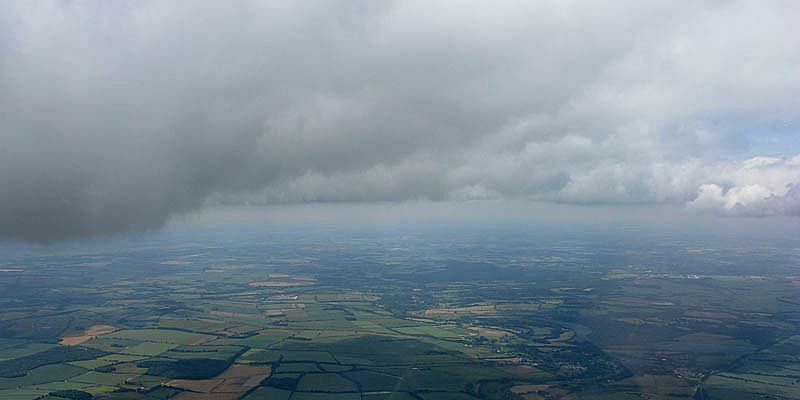 Once again I managed to get above cloud at times, although this time it was all in clear air, going up the sides of some of the clouds a bit. 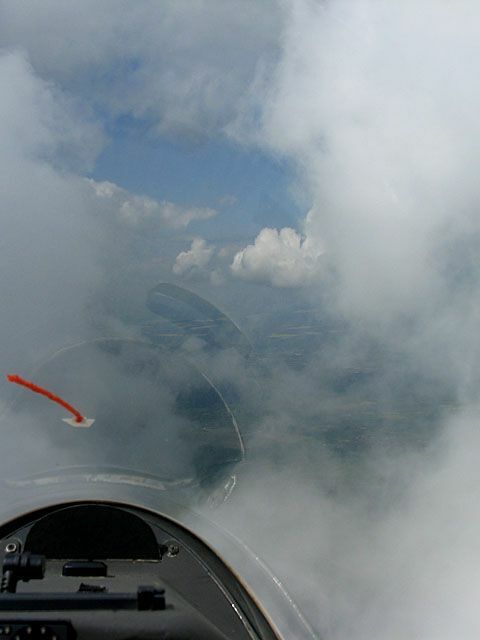 Cloud shots as I edge up the sides of some of the clouds. The 2nd pic looks like an armoured gladiator about to touch down with a rugby ball. Quite bad spreadout in places. You can see how big the gap to the next street is already. Flirting with the clouds some more. 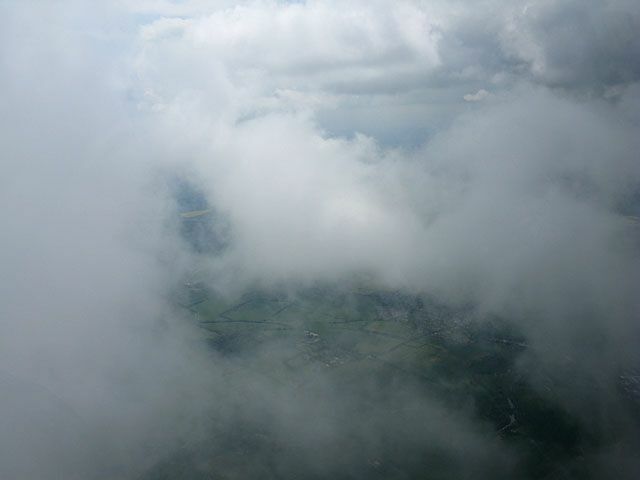 More above cloudbase shots as I managed to climb up the side of a cloud in clear air and then fly over the top of some lower clouds. 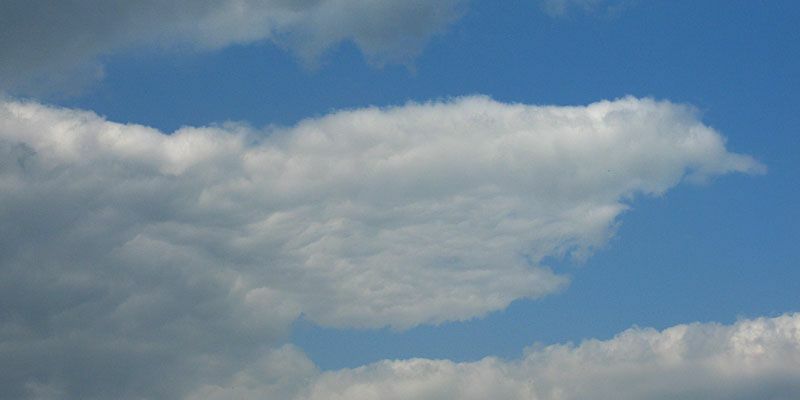 Another cloud shot. 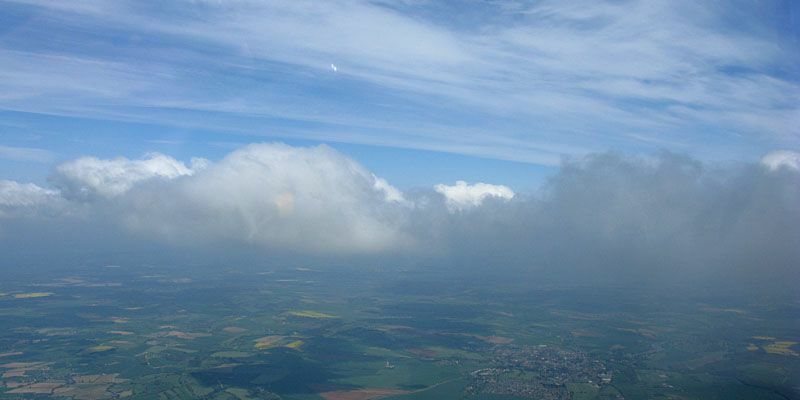 Pictures taken during an out and return to Chard for 279km. 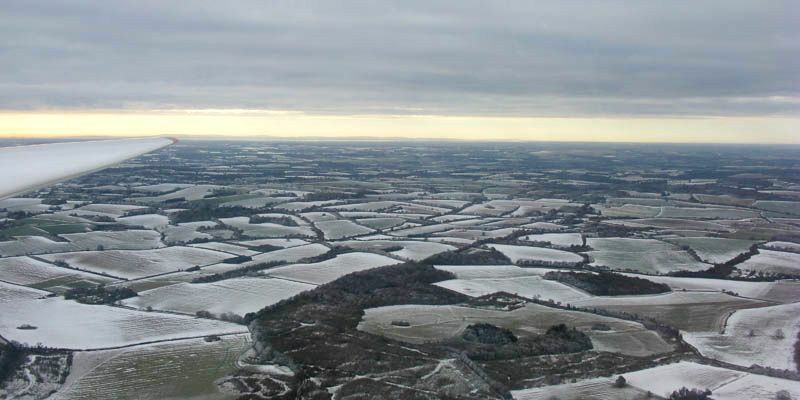 Looking towards the Jurassic Coast as I approach Yeovil from the East. YEO from the South. The turnpoint is the far (north) end of the road bridge over Sutton Bingham Reservoir where it goes under a railway line. 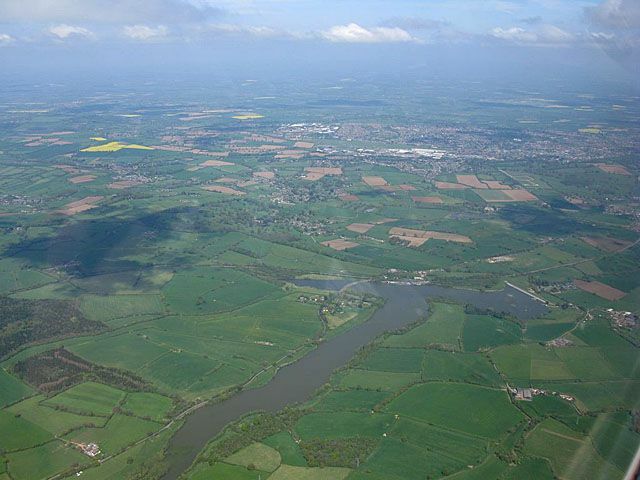 Yeovil itself visible in the background. 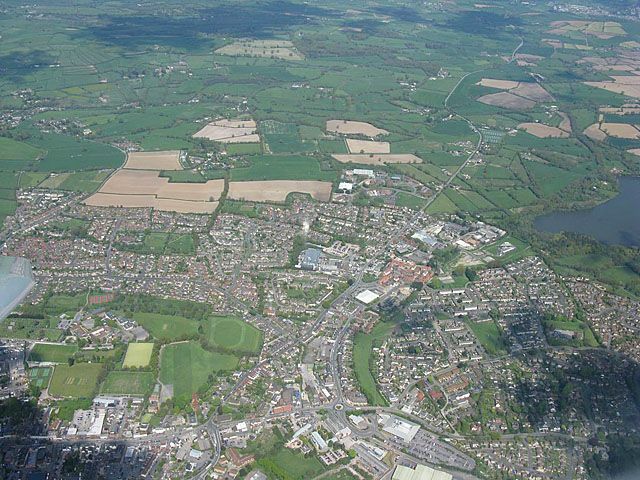 Looking down at Chard while soaring, faceing North. 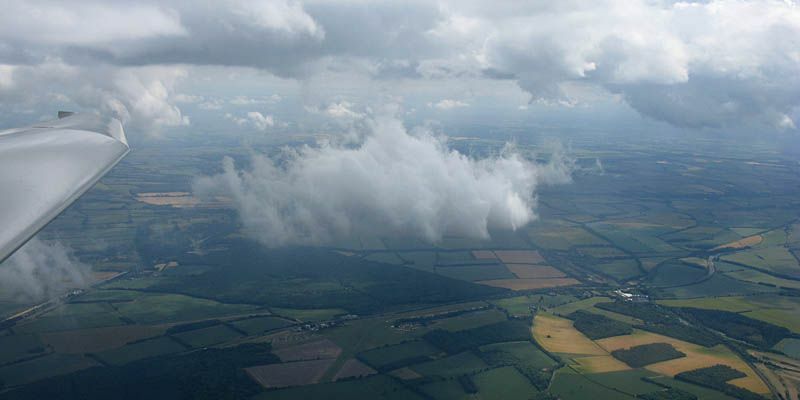 Up at cloudbase on the way home. 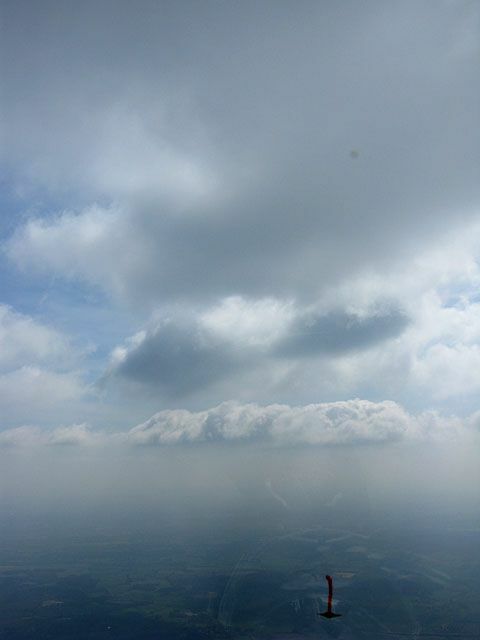 To the West of Salisbury I took a cloud climb to 5700 feet QNH. 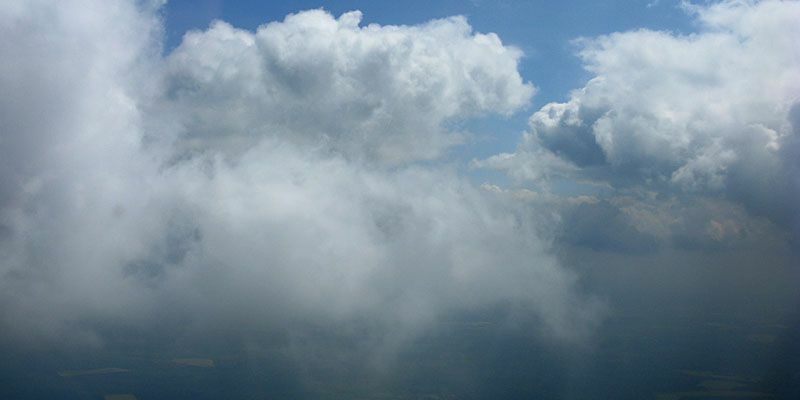 When I popped out the side I found myself over the top of smaller clouds. 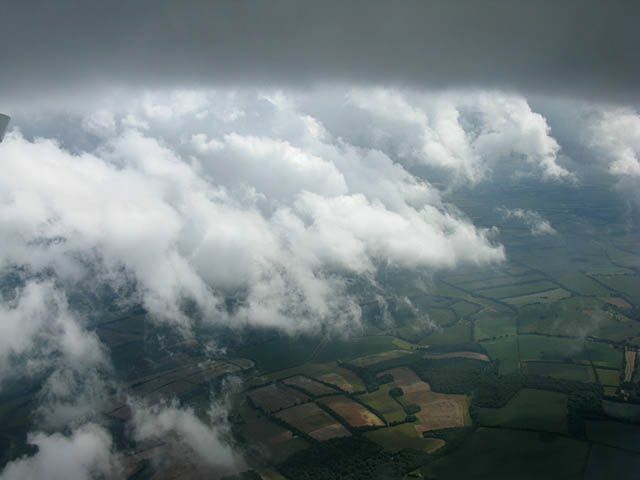 These 4 pictures were taken as I emerged and sunk slowly back to cloudbase. 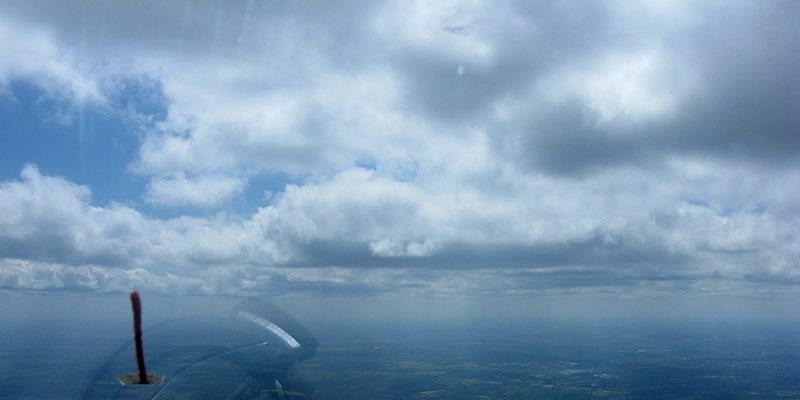 Pictures from my first 300km flight of the year - LAS-TOW-DID-BUC-LAS. 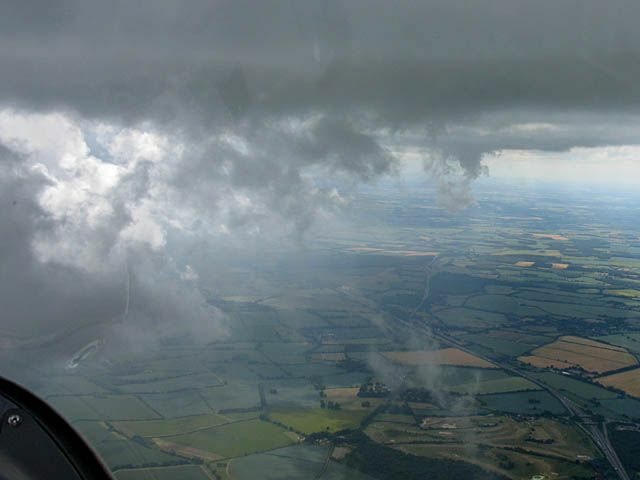 Viz was rather poor but thermals were excellent north of Didcot. They were still good in the blue to the south too. 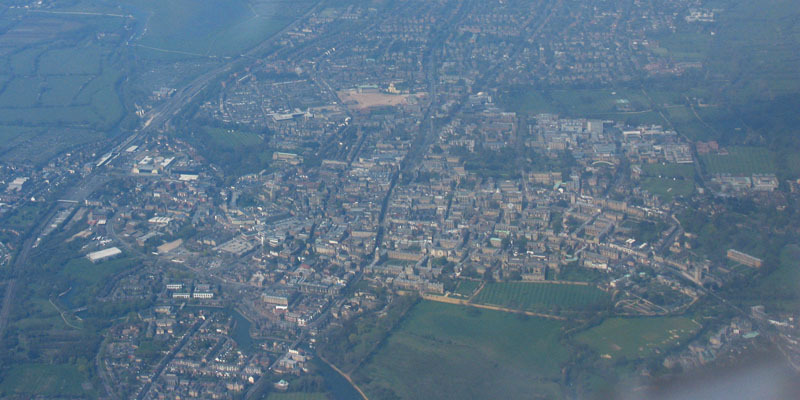 A very hazy digitally enhanced view of Oxford University. 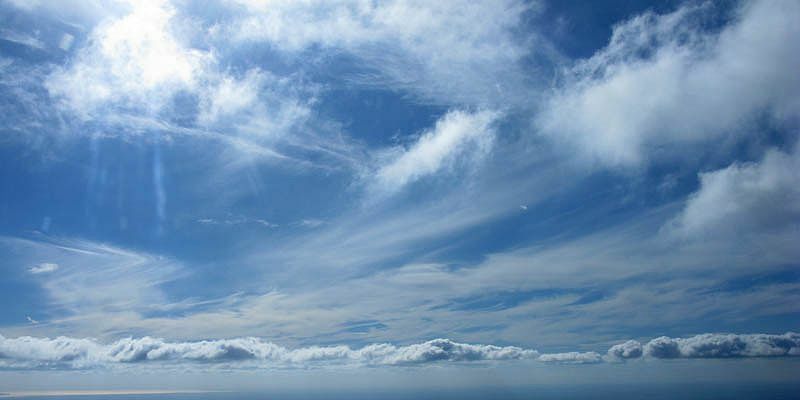 Crisp and clear above. Very murky below. 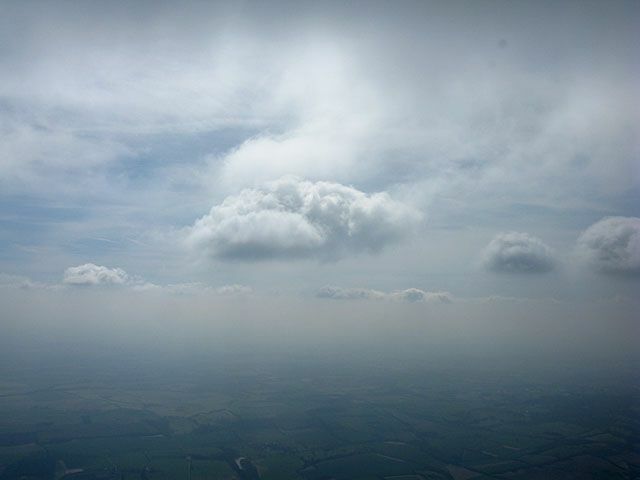 Viz was very poor today below the inversion. 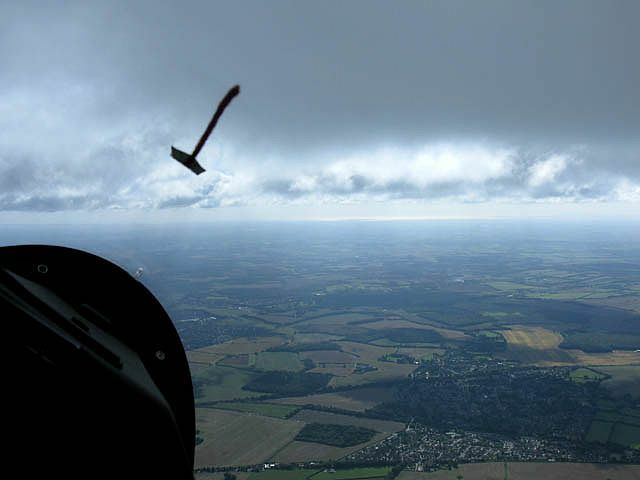 Soaring high. 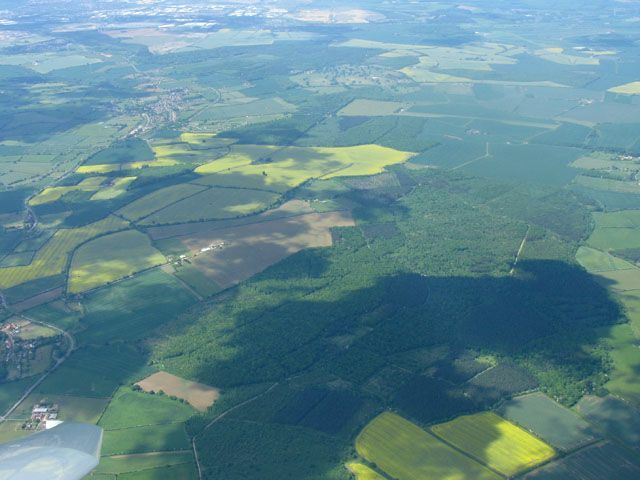 About 4850 feet above Lasham / 5420 feet QNH on the LNav. 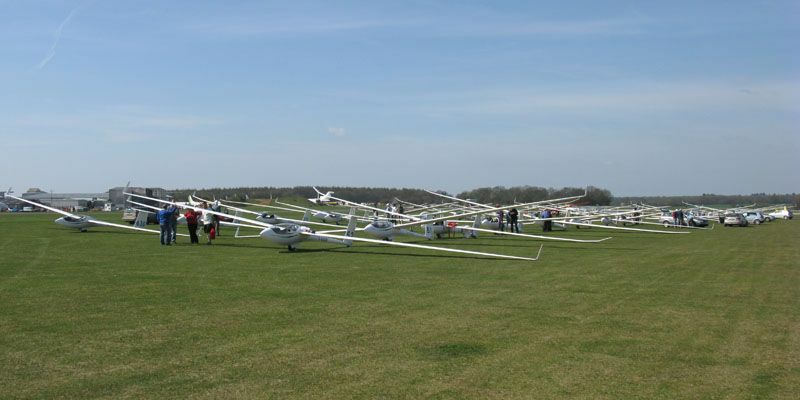 Pictures taken on the day of my first cross country flight of the year. LAS-CBN-DID-LAS for 134km as well as some general fun. 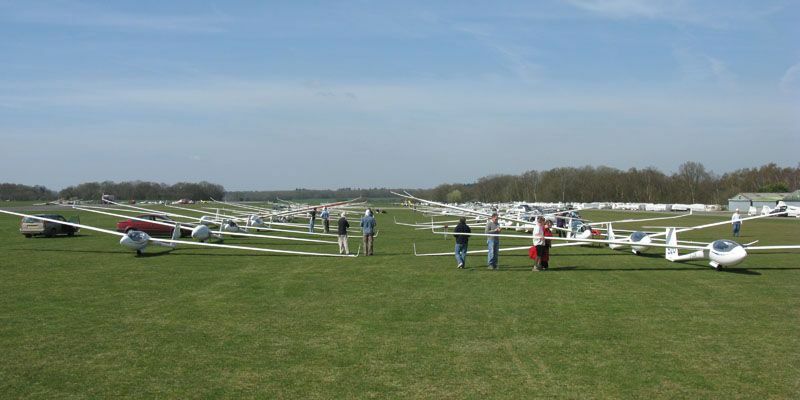 One of the first big grids of the year. 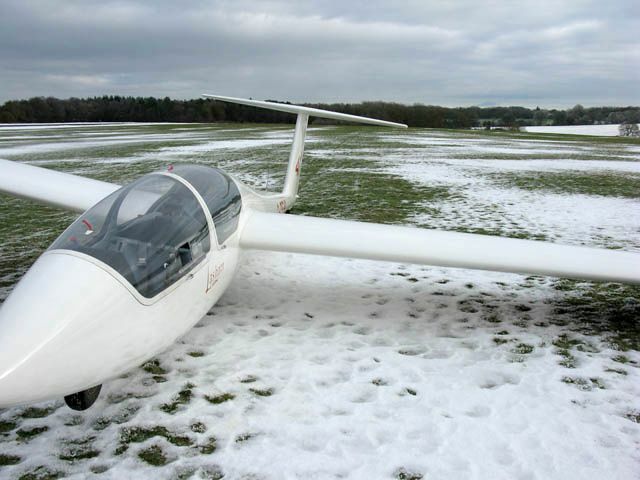 I flew glider Sh2, shown in the 3rd pic. 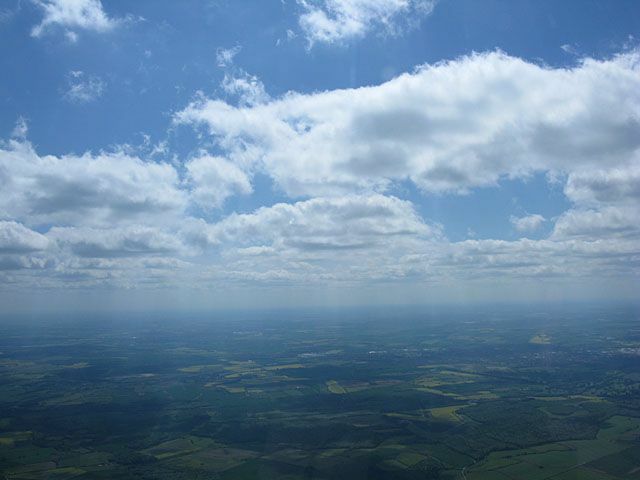 Nice conditions locally under shallow cumulus in hazy conditions. 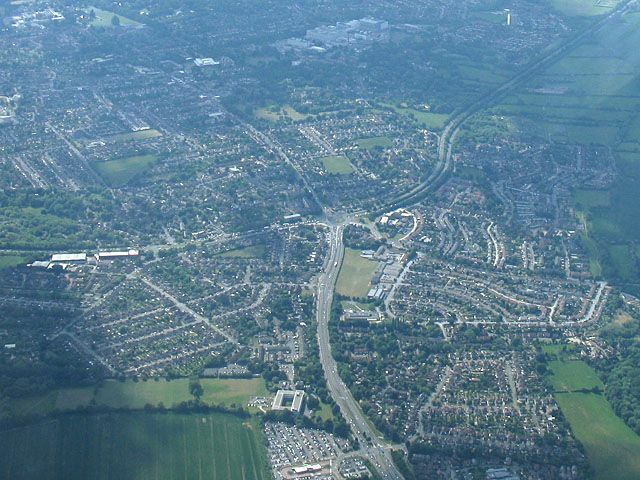 Soaring over Newbury, looking West towards the race course (centre). 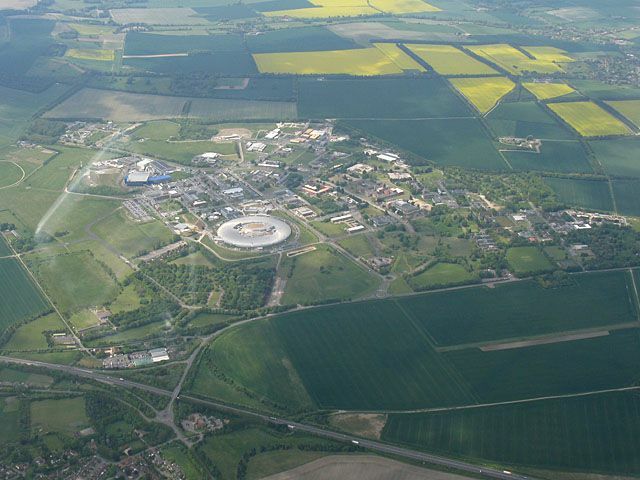 The coloured pools are a gravel works. 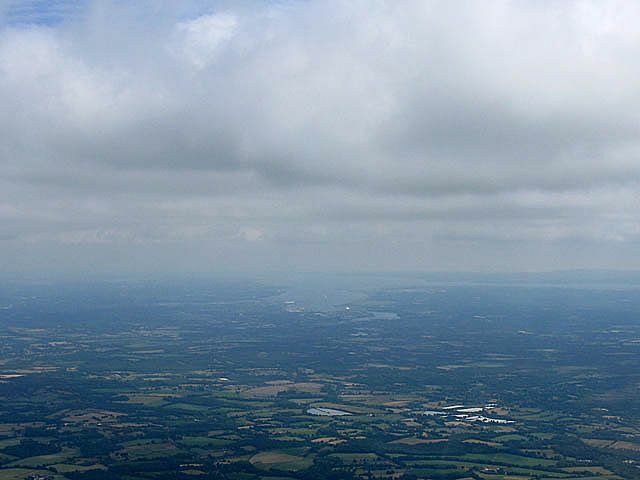 Greenham Common visible far left. 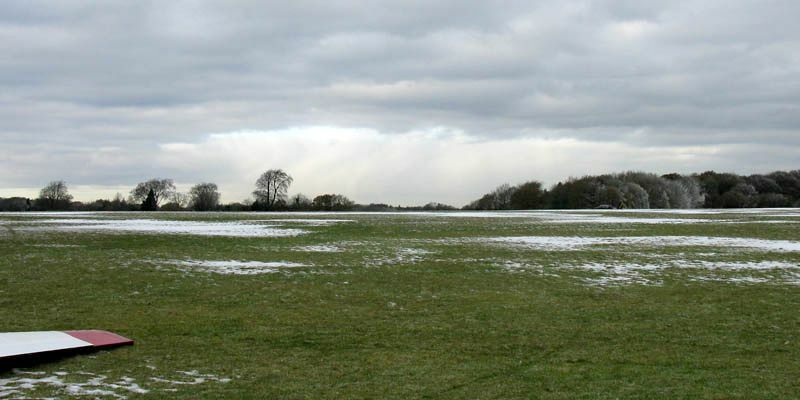 Ground pictures from the Dunstable Downs and Lasham Airfield. 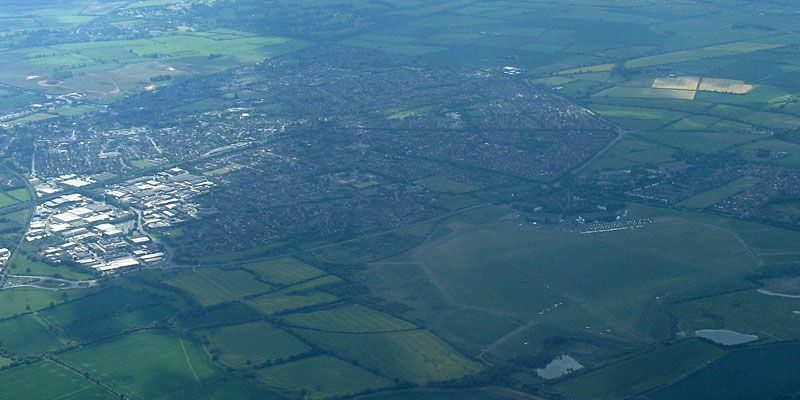 The Dunstable launchpoint as seen from the Dunstable Downs ridge base path. 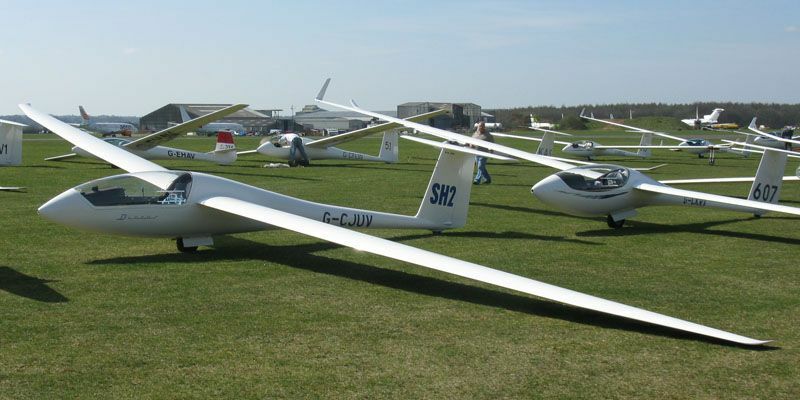 The glider with green tips is K21 FBV, the glider I had my first ever glider flight in. 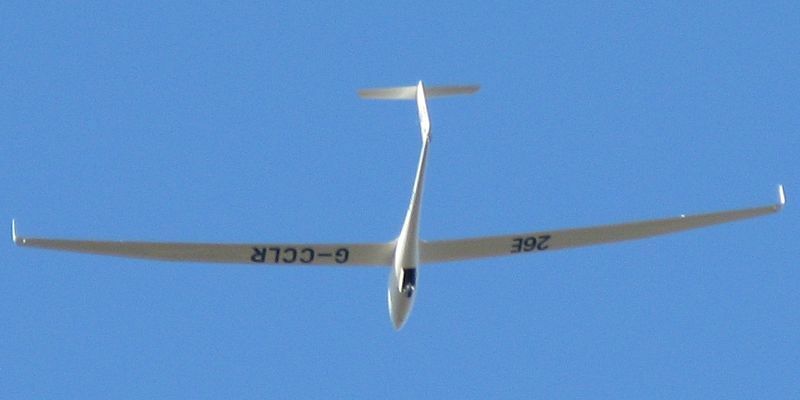 Glider flying low over the Dunstable Downs ridge. 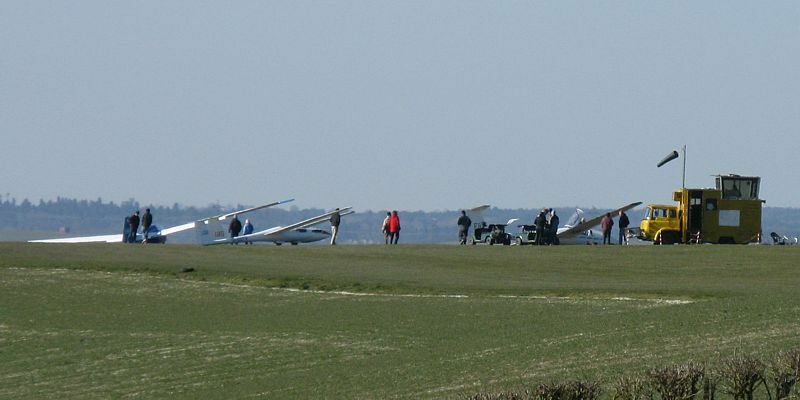 A gaggle of gliders sharing a thermal close to Lasham airfield. 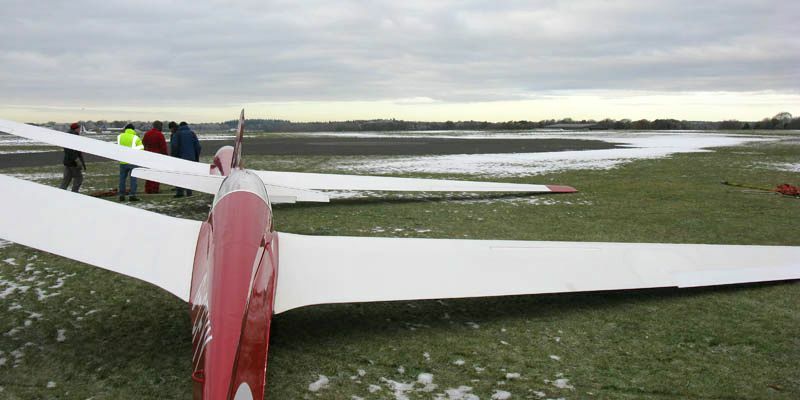 A few pictures taken around sunset after my first soaring (and very cold) flight of the year. The last launch of the day. 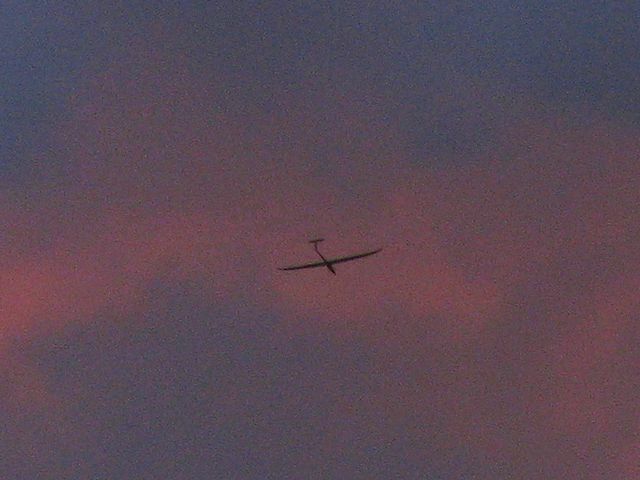 Fuzzy low light level shot of a DG1000 Glider about to winch launch. 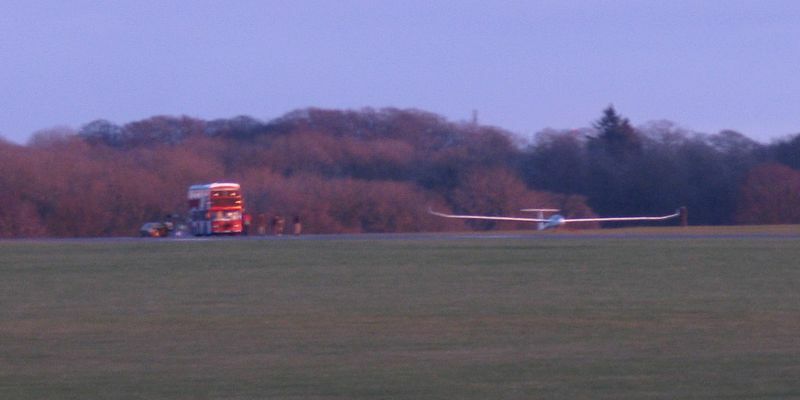 DG1000 Glider flying into a gorgeous sunset over Lasham Airfield. 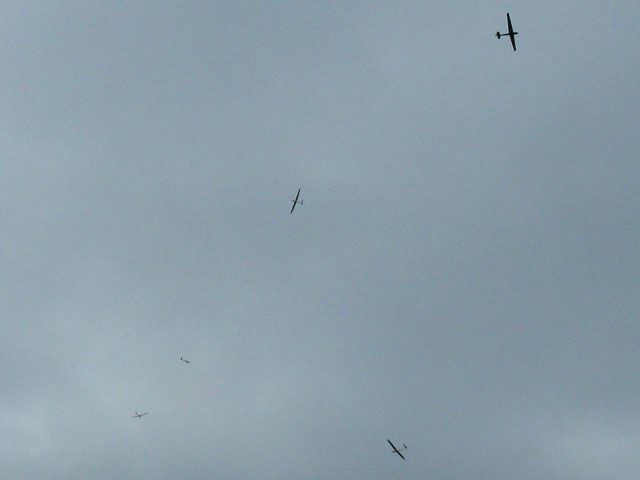 Glider is visible near top of first picture. 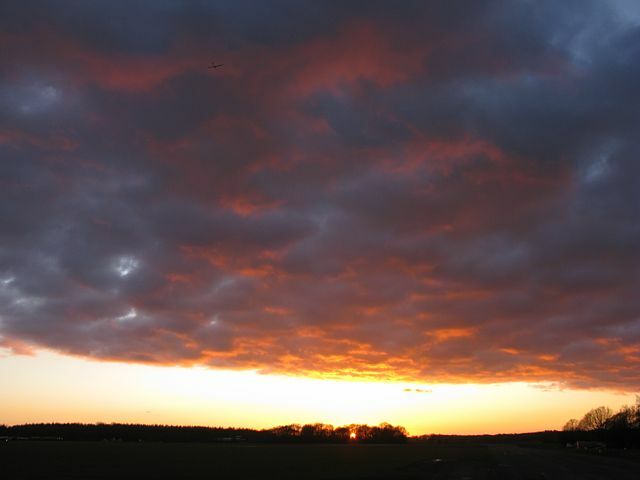 A wider angle multishot panorama of the sunset. 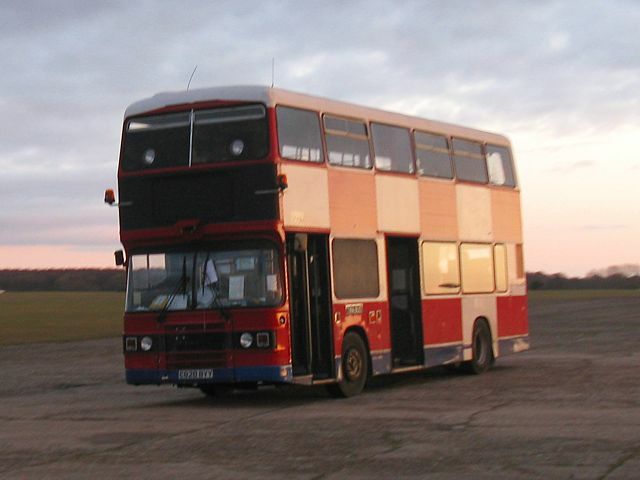 The launch point bus on its way back to its hangar.